Happy Easter! Since I had the good fortune to be off of work for Good Friday, I took the opportunity to head to the mountains for a little bit of landscape work. It has been a long while since I've shot grand landscapes, and I really wanted to get back in that swing once again. 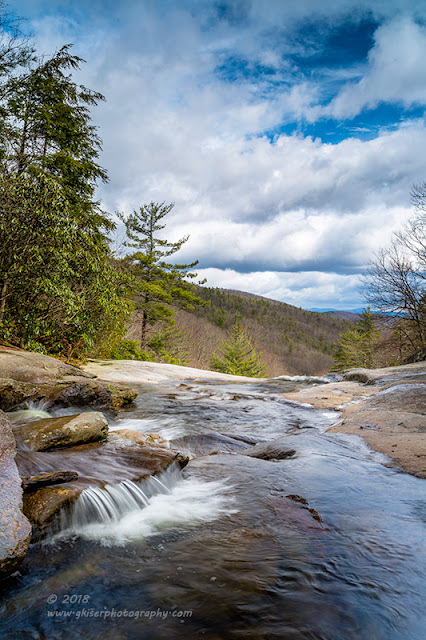 With Spring finally upon us, the mountains are starting to green up a little bit, and I figured that now was as good a time as any to go back to my beautiful Blue Ridge Mountains. 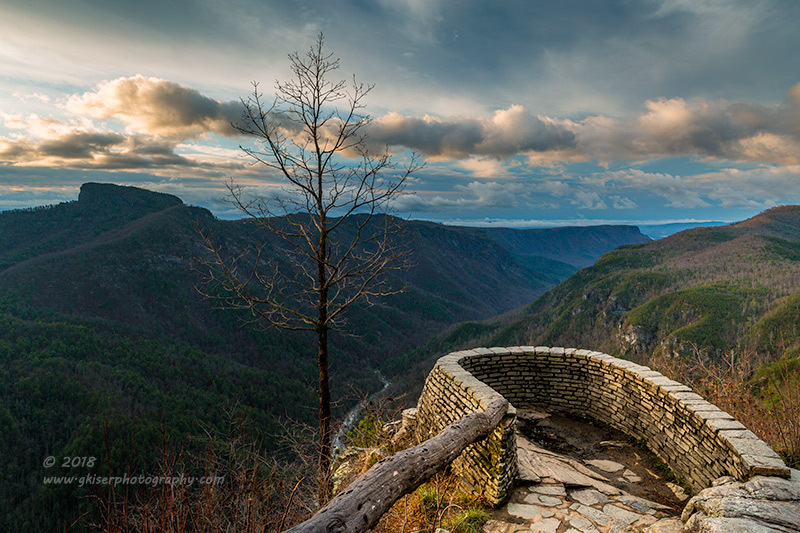 I have been toying with the idea of going to Wiseman's View for some time now. I've never been, but hear that the hike is a piece of cake, and the views are pretty remarkable. From my research, I knew that the overlooks faced East, so that would make for a good setting for a sunrise. The weather forecast wasn't all that convincing, and I wasn't sure how the sunrise would go. I knew that there would be clouds, and that was a start. With Wiseman's View about 2.5 hours away, I was going to have to get up very early in order to make it out there before sunrise. That meant waking up at 3am, and leaving at 3:30. This is not my favorite thing to do by any stretch, but in order to get the sunrises in the mountains, it is a necessary evil that I have to put up with. The trip went off without a hitch, and I actually really enjoyed the fire road up to the trail. For the first time, I was actually wanting more lights on the 4Runner because it was dark, and in some sections kind of technical to maneuver. At any rate, I got to the parking area just after 6am which gave me plenty of time to scope out a position to shoot the sunrise from. The trail was really short and terminated at two different overlooks. The views were incredible, and the best part was that there was lots of low laying clouds in the gorge. I was excited about how the pictures were going to work out as the sun came up. I started to figure out different compositions that covered several different "what ifs" because I needed some alternate plans in case the sky didn't work the way I wanted it. I started the morning out with my 24-70mm with the Lee Filter Holder screwed on the front just in case I needed an ND grad filter. I started to compose the images, and did a couple of test shots to see how the sky was going to look with the long exposures. The second image above was one of my 30 second exposures that actually picked up a good amount of color low on the horizon. That color turned out to be my only color for the morning unfortunately. But...I was noticing that there were a lot of clouds low in the sky behind Table Rock and Hawksbill. I decided that this would make for a pretty good shot with the little bit of color at the horizon. 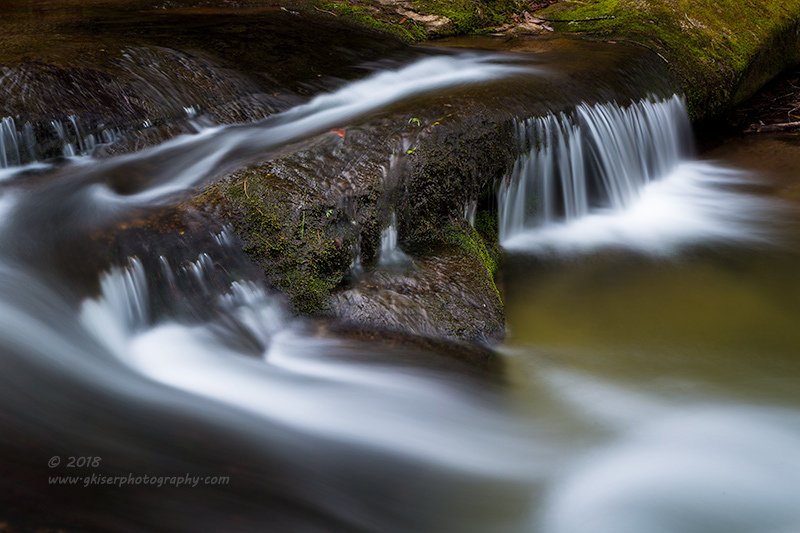 I swapped out my lens with my 70-200mm and added a 2-Stop ND filter to help keep the sky under control. I set up a panorama by leveling the tripod, and doing a test sweep to find my focal point. It all came together rather nicely, and I was able to capture the low clouds between the book end mountains. Obviously, I was wanting more color in the sky, but this was working out pretty nice. The problem was there wasn't really that much change going on with the sky. I tried some isolations with the long lens, but none of them really worked all that well. I started to look for the morning light to hit other parts of the gorge so that I could work on some different compositions with the dramatic low sun lighting things. 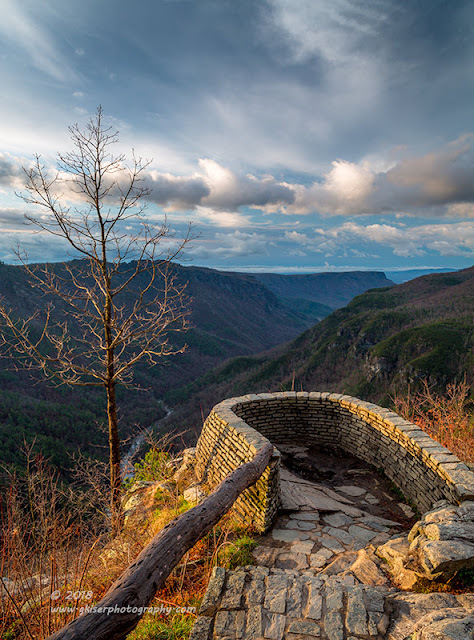 As the sun came up, it started to illuminate the other overlook. I tried to shoot it from where I was, but the composition wasn't good at all. I decided to pick up everything and move to the other overlook. When I started down the spur trail, I could see that my composition was right here. There was no need to go to the overlook because the overlook was my picture. I actually shot quite a few images with different lighting as the sun rose. Of course for these, I swapped out the lens once again for the 24-70mm and added my Color Combo Polarizer to make the sky pop a little bit. The warm sun not only felt great after a chilly sunrise, it was providing some spectacular light on the right half of the gorge as well as the overlook. there was even a lone tree that was there to catch the light as well. I think that the warm sun lasted about 10 minutes before the sun snuck behind a cloud. With the warm light done, I decided to pack up and head back to the truck. 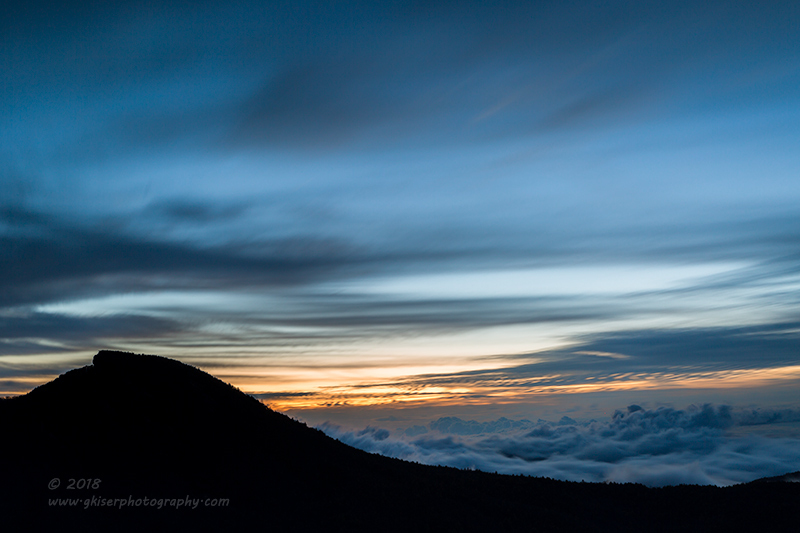 With the sky looking this great, I decided that I would try to hike up to Hawksbill for some more cloudscapes. The drive down the mountain started to convince me otherwise. The clouds were filling in quickly, and I wasn't convinced that the sky would remain that dynamic for long. I know that the hike takes a little bit of time, and time was something that I didn't really have. 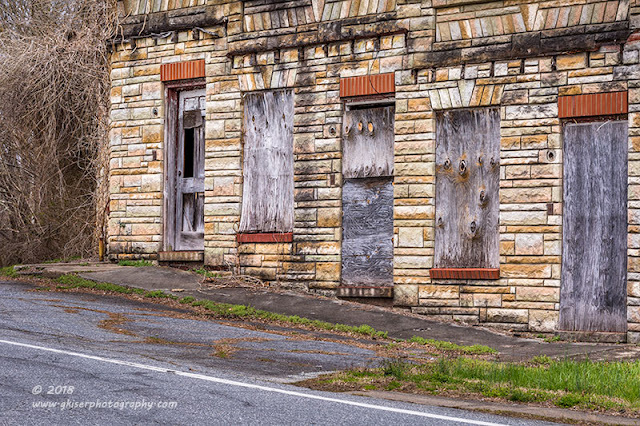 As I pulled out, onto the main road, I decided that I would try to shoot an old cabin that I had seen the last time I visited Linville Falls. 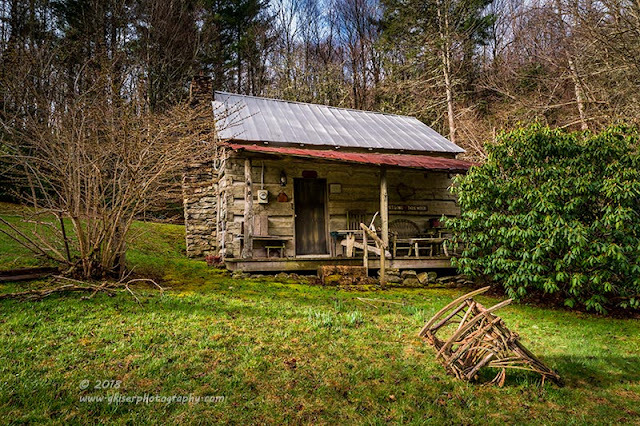 The last time I had seen this cabin it was pouring rain, and I wasn't going to try and shoot it in those conditions. Today, the sun was illuminating it nicely and there was still a bit of blue sky behind it. Interestingly, the rocking chair that I had seen in the front yard was now upside down. Not sure if that was on purpose, or not. I do know it made for an interesting counter element to the sign on the front porch that said "Sit Long Talk Much." Kind of hard to do that when the chair is upside down. I went ahead and pulled over on the side of the road and got my gear out. For this, I fitted my 24-70mm lens with my Singh-Ray Color Combo Polarizer and set up near the roadside. 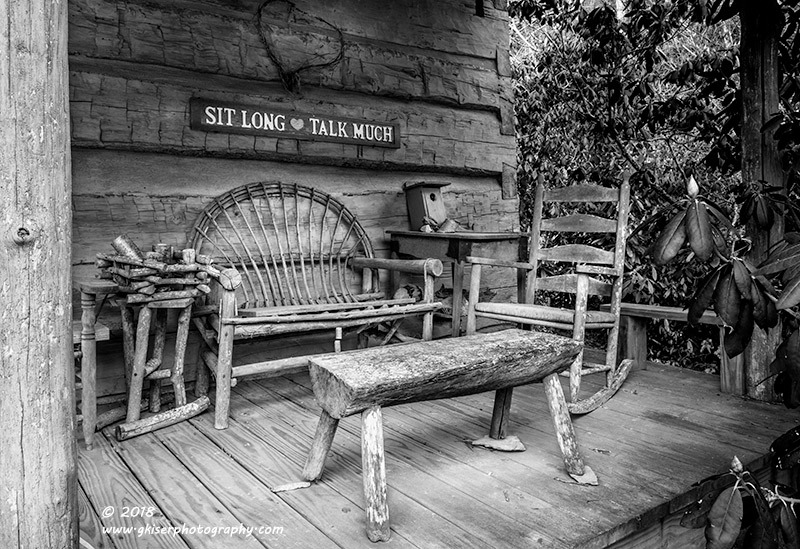 I was having a hard time getting a cohesive composition with the two bushes and the rocking chair all around the cabin. I don't like putting the main focal point in the middle of the frame, but that was where it made the most sense for this composition. I think that it worked out pretty well. While I was shooting the cabin, I found that my main interest was on the porch...specifically the sign that I mentioned and the chairs. It just seemed very welcoming. I was pretty sure that this cabin was not a primary residence, and I felt that it would be ok to get in a little closer to it. I kept the same camera set up as before, and moved in for a closer look. I'll be honest, I wasn't thinking about a monochrome image when I was composing the shot. It wasn't until I was processing it and started to have a hard time with the green tree to the right that I decided to give B&W a try. I clicked the button and the color was removed. Hmmm, I kind of like it like this. I started to play with the color channels to get the right balance and liked it even more. I then went in for some local adjustments and decided that this was now one of my favorite images. The monochrome approach really set the scene and draws your attention to exactly where I want it to be. It also has a nice timeless quality to it as well. There wasn't much else that I wanted to shoot on this old cabin, and the sun was starting to dip behind the clouds a bit. I packed up my stuff and started to drive again. I had given up on Hawksbill and decided to drive around a bit and look for some more rural settings to photograph. I found a couple, but nothing that I was ready to shoot just yet. In the back of my mind I was thinking about how I had wanted to shoot landscapes today, and here I was looking for rural photographs once again. I got turned around and headed for the Parkway just a couple miles back. When I got on the Parkway, the clouds were looking pretty good to the West. I started to look for landscapes, but the only thing that caught my eye was the bridge for Hwy 181 as it crossed the Parkway. I had shot it before, and the conditions were better the previous time so I didn't both to try any new shots. I found the closed section near the Viaduct and turned around. I worked my way down to another closure without any further luck. Today was not going to be the day for the Parkway, and the clouds were getting thicker. I abandoned the Parkway and got back on Hwy 181 headed home. 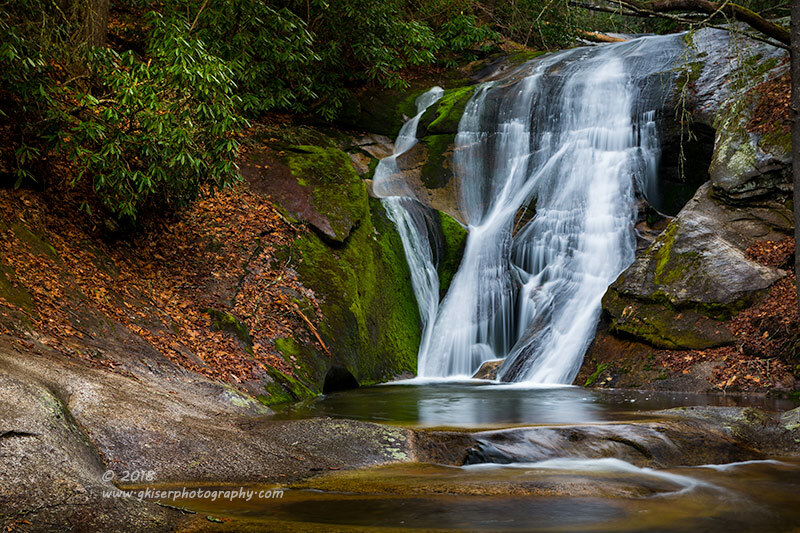 Just as I got settled into the drive, I saw the sign for the Upper Cascade Falls. It had been since 2009 that I visited here last. It was a spur of the moment decision to turn into the parking lot. Once there, I was faced with a choice. I could go to the Upper Falls, or the Lower Falls. I had been to the Upper Falls before, so I was kind of interested in seeing the Lower one. The decision was made and I grabbed my equipment and started the hike. I'll say that this hike wasn't the easiest to follow. There were lots of shortcuts which had been trampled in over the years. That made following the trail very difficult and I kept ending up on the shortcuts. The trail zig zagged down the side of the mountain and the makeshift shortcuts connected the trail segments but required a bit of finesse to navigate without slipping. The blazes were not that consistent and several times I wondered if I had gotten lost. I could hear the water, so I knew I was close. I finally got to a segment of the trail where I could see the Lower Falls and started to study it. It was essentially a large water slide without much character. The sun was pounding on it as well which made proper exposure difficult. As I got closer, I saw that there wasn't really a good place to shoot it from without getting my feet wet. Since I wasn't planning on shooting waterfalls, I didn't have my proper boots for the job. I hated to, but I turned back knowing that this was not a worth while waterfall today. Back up the mountain I went. I made it back to the parking lot fairly quick since I had figured out how the trails worked. 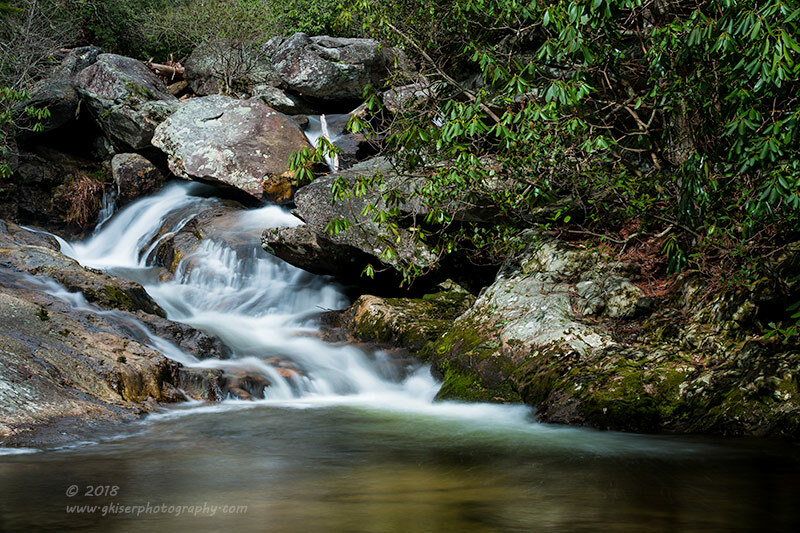 I noted that the clouds were coming back in the sky, so I decided to continue across to hike out to the Upper Falls. I recalled the hike to be rather short (since I made the return trip in the rain last time). The more I hiked, the more I questioned my memory. It wasn't really that long of a hike, but it did take more time than I remembered. Maybe that is just a product of getting older. When I got to the base, I could see the familiar waterfall. The water flow was good, and the lighting seemed to be pretty decent for it. At least this time, I had a clear field of view without the fog that obscured it last time. Due to the distance that I had to shoot it, I fitted my 70-200mm lens, and added both my Singh-Ray polarizer and the B+W vario ND filter. Together, they allowed me to use a shutter speed of around three seconds in the daylight. I worked the falls from a couple of positions perched atop rocks in the water. My main goal was to keep my feet dry since I didn't have my waterproof boots on today. I remembered another composition that I shot the last time I was here. It was a landscape beyond the top of the waterfall. It had been cloudy then, so I cut most of the sky out and concentrated on the water. It was a little awkward, but had showed promise. The clouds were looking fantastic in the sky today, and I also noticed a nice cascade I could use as a foreground. I swapped out my long lens for my 24-70mm fitted with the B+W Polarizer (slimmer body) and the Lee Filter Holder. I composed the image, and saw that there was a pretty big difference in exposure latitude. I thought about rolling the dice, but I was pretty sure that there was just goo much difference for the 5D to capture. I went ahead and added a 3-Stop ND Grad and saw that there was still too much latitude to deal with. I added an additional 2-Stop ND Grad which brought the scene into proper exposure. I wasn't able to use a very long exposure, but it was just long enough to blur the water in the foreground so I was happy with that. I remembered seeing this bus before when I was out exploring, but it had been raining at the time. It was dry today, and it looked like the owner was there so I could ask permission to get in close to shoot it. You see, there were signs all around stating that this was private property, and I didn't want to violate that. I walked in and explained what I wanted to do, and the owner was happy to let me shoot the bus. His only request was that I did not give the location of the bus. So that will remain a secret. I went out to the back yard and set the camera up. Since I was able to get in close, I opted to go with my 24-70mm lens and the Singh-Ray Polarizer. The sun was a bit harsh since it was getting close to noon by this point. I decided that it was probably better to shoot some isolations to capture the textures of this old bus while the sun was so bright. 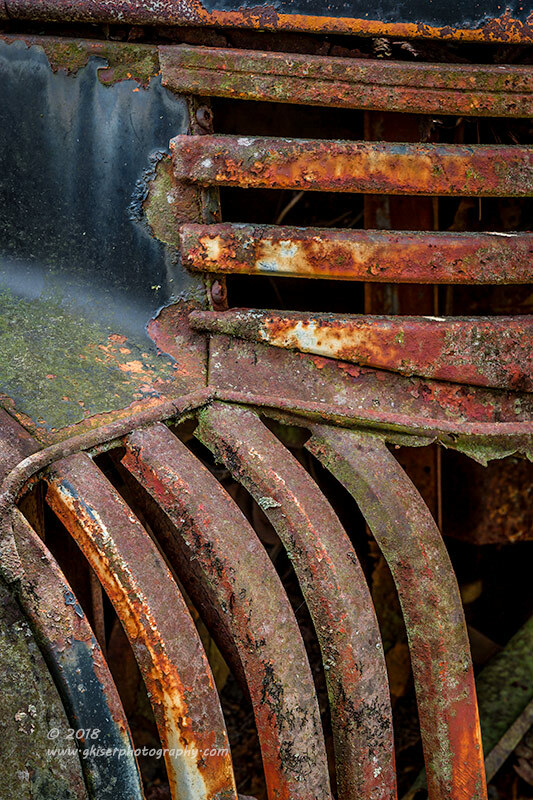 Of course, the grill on this old bus was just too cool to ignore. I shot it full on, and also used it as a framing element in other compositions. When I was done, I realized that the interplay between the grill and the headlight was my favorite thing to work with. I had several plays on that same theme. Normally I would just pick the best and roll with that, but in this case, I felt that the compositions each stood well on their own. They are similar, but very different at the same time. 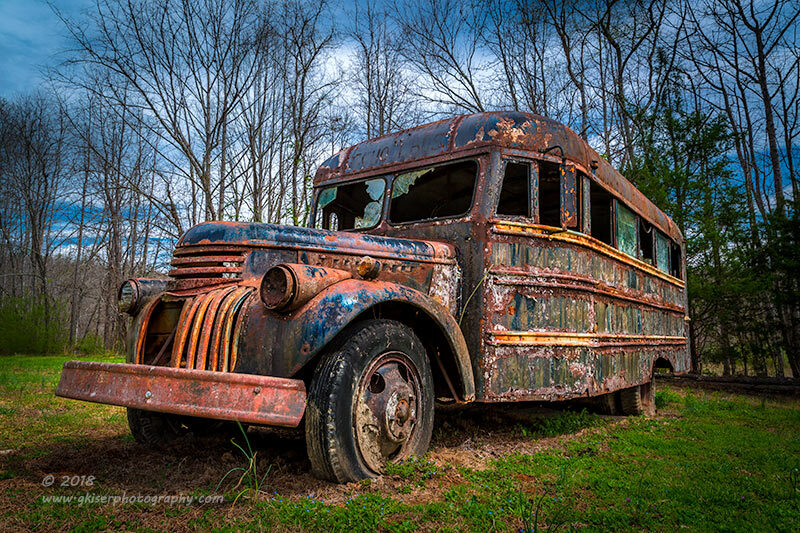 it was the whole bus that had caught my eye from the road and I was dead set to photograph it before I left today. When the clouds started to cover the sun, I saw my opportunity. I pulled back, got down low to the ground, and framed up a shot that showed the bus as a powerful element against the bare trees and the cloudy sky above. This was the image that I had wanted to get when I saw the bus. The patina of the siding was just too perfect. 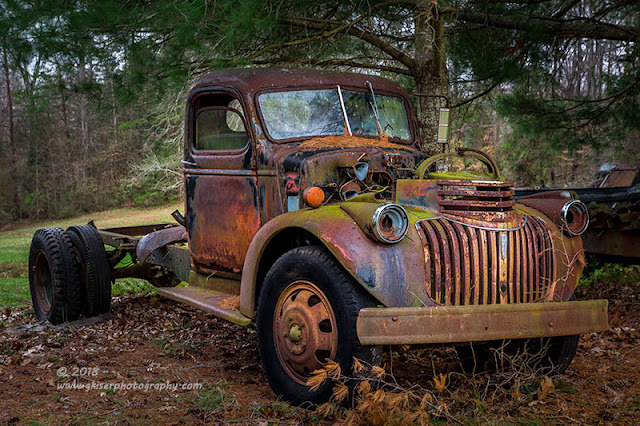 The broken windows, missing grill slats, and the flat tires just told so much of the story. You can even make out the remains of "School Bus" just above the front windshield. I'm really not sure that this would have worked as well with the trees covered in leaves. I'm very happy that I was able to capture this bus today. It wasn't planned, but it sure worked out well. 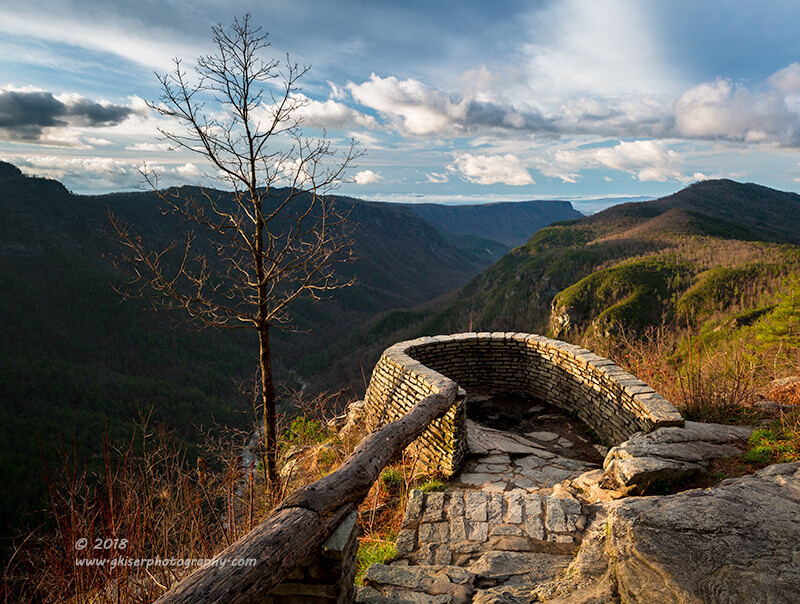 I had set out this morning to photograph the Linville Gorge and do grand landscapes. I accomplished that task, and added in a bit of white water photography as well. For a landscape photographer that really should have been a full and complete day. For me, I wasn't totally satisfied with just that. I got excited over the old cabin, and found myself almost giddy photographing this old bus. I'm starting to see a change in my photography lately. I seem to really be drawn to the subjects showing their age. I'm not sure the reason behind it, but I'm feeling more at home with my derelict subjects these days. I don't know if this is a permanent thing, or something that is just due to the season. With Spring getting ramped up, I'm sure that the answer will become apparent. While I'm waiting on the answer to that question, I will keep shooting what I'm drawn to. I'll continue letting my camera tell the story about what is inside of my head, even when I'm not sure myself. One thing I do know, I enjoy making images of what excites me, and I'll continue doing just that for as long as I can. I'm going to start out by saying, I am really starting to hate the weather this year. It seems that every weekend I'm faced with rain, snow, or blazing sun...sometimes on the same day. It is forcing me to get creative and venture out on very rainy days when normally I would stay home. This weekend, was looking to be a little better than most with mostly cloudy skies for the first part of the day on Saturday, followed by rain, turning into snow, and eventually accumulating to an inch or so. Sunday was looking like a mess potentially so I made the decision to go out early on Saturday and do some photography. I checked out the sunrise forecaster and saw that there was a moderate chance that I would get to see some color in the sky at dawn. That meant that I might as well wake up early and try to shoot a sunrise. The question was, where to go? 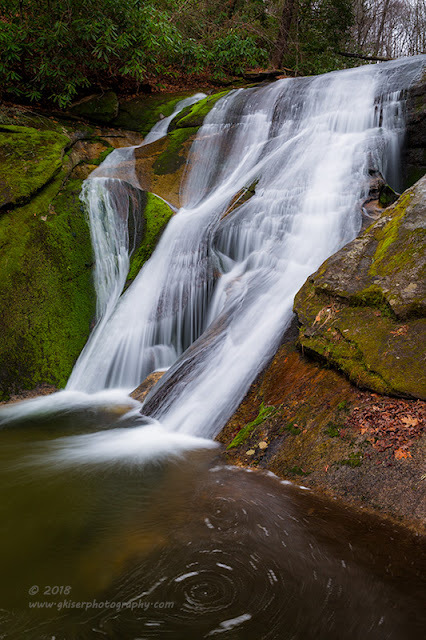 I had been thinking about going to Stone Mountain after all of the rain that we have had to work on Widow's Creek Falls again. This is one of my favorite waterfalls to go to because of its character. The clouds would be great for that, and according to the forecast, the rain/snow would not start until about 3pm. That would give me plenty of time to walk along Bullhead Creek and Widow's Creek from the lower trail head. 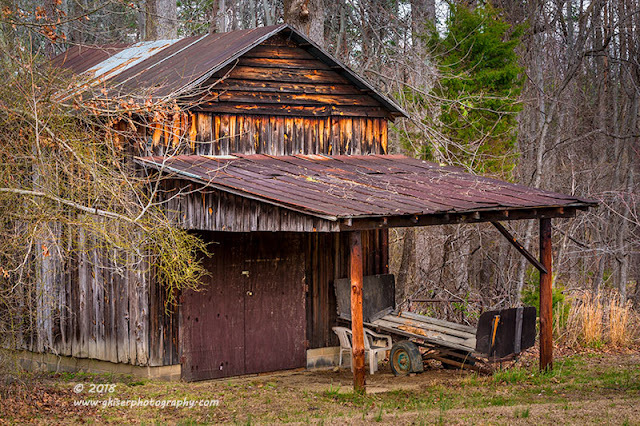 As far as sunrise, I thought that I would try to shoot it using a barn that I've seen several times in Yadkin County which was on the way to Stone Mountain. I woke up with Toni at 4am and checked the weather. The sunrise was looking less promising, but the clouds were still good and the rain was still scheduled for around 3pm. I decided that my plan was still a go, so I rolled back over and slept for a bit longer since I didn't need to leave until about 5:45 to get to the barn for sunrise. Once I got up I was pretty excited about the prospect of the day. I had a couple of good destinations in mind, and was looking to shoot things that I had not shot before. I was making great time down the highway, and actually got to the barn a little earlier than I had planned. I started to scope out the scene to see how the sun would be in relation to the barn. My estimations were a little off unfortunately, and the angles that I had thought were not going to work. To make matters worse, I was going to have to include a very large power pole in the composition that I did not really want there. I still had time to get to another potential location in Traphill where I could shoot a sunrise. I got back on the highway and continued on. As I was heading up 77, I was looking to my right for any indication that there might be a decent sunrise. It really didn't look promising at all. It appeared to be much too cloudy for any color to develop. Based on my time, if I skipped the sunrise, I would make it to the park right at 7 when they opened the gates. The way I saw it, I couldn't lose. When I arrived at the field where I was thinking about shooting the sunrise, the sky was getting brighter, but wasn't showing any color at all. I didn't even break stride as I drove by destined for Stone Mountain. I got there just as the park was opening up. In fact, I had to wait at two gates for Rangers to open them up. I arrived at the lower trail head and checked the sky once again. It was just gray, and it was about 5 minutes away from sunrise. I could have hoofed it over to the meadow that I like to photograph so much, but I really didn't think that it was worth the jog. I was also noticing that it was flurrying which probably meant that the clouds were a little too thick for any decent color. 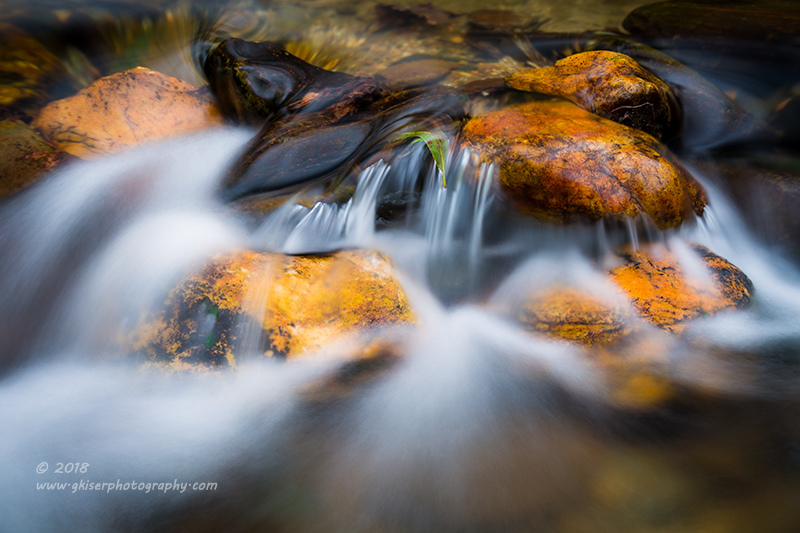 I grabbed my gear and started to walk down the main road which parallels the two creeks I wanted to work with. The first stop on my walk was a picnic area that I had never visited. It was right along a section of the Bullhead Creek and I could hear rapids. Sure enough, there was a nice little water feature within easy reach. I grabbed my camera and fitted the 24-70mm lens with the Singh-Ray Color Combo Polarizer and started to find my compositions. The sun was still very low and the light was quite dim. That allowed me to shoot at 20-30 seconds of exposure. That is a little longer than I really like, but for the mood I was going for, it was perfect. As I was shooting, the snow was falling a little more heavy now, and I was pretty sure that the forecast was wrong about the starting time. I happened to look up at the sky a little while after sunrise. There was a pale pink hue in the clouds. It wasn't anything that I would have been interested in photographing so I was pretty happy with my choice of getting my feet wet. There was a little water slide below where I was shooting that I went over to investigate. There was a small bit of white water, but more interesting was a flat rock that was propped in the creek bed in a diagonal fashion. I also saw a tree with a rather complex trunk system that caught my eye. I went ahead and started to work that scene out. The rock paired nicely with the white water coming off of the slope. 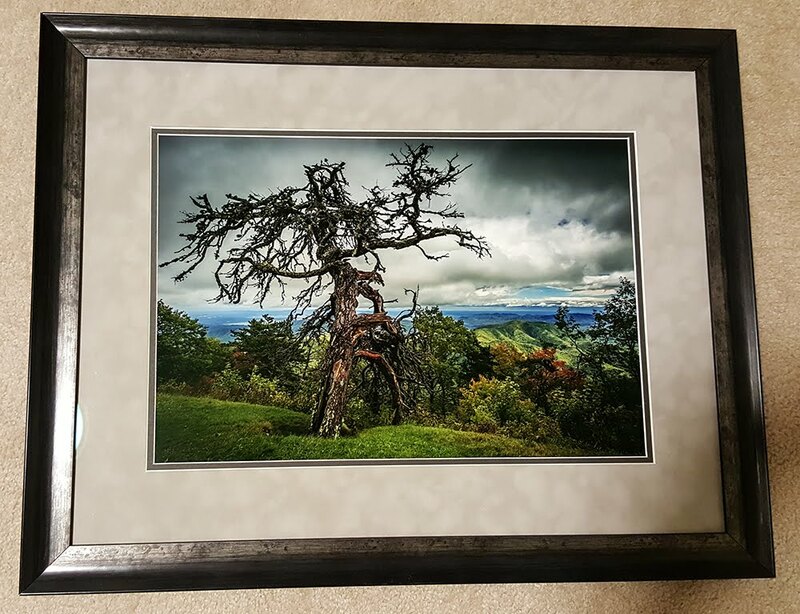 The two really framed the tree quite nicely. When I was done at the picnic area, I kept the camera built and continued down the road to another section of the Bullhead Creek. I found a point of interest and started to shoot some compositions. I wasn't liking what I was getting and I decided to swap out my lens for the longer 70-200mm so I could shoot some isolations. This worked out better, but when I got home I decided that none of them really stood out as something special. Ultimately, they got trashed. 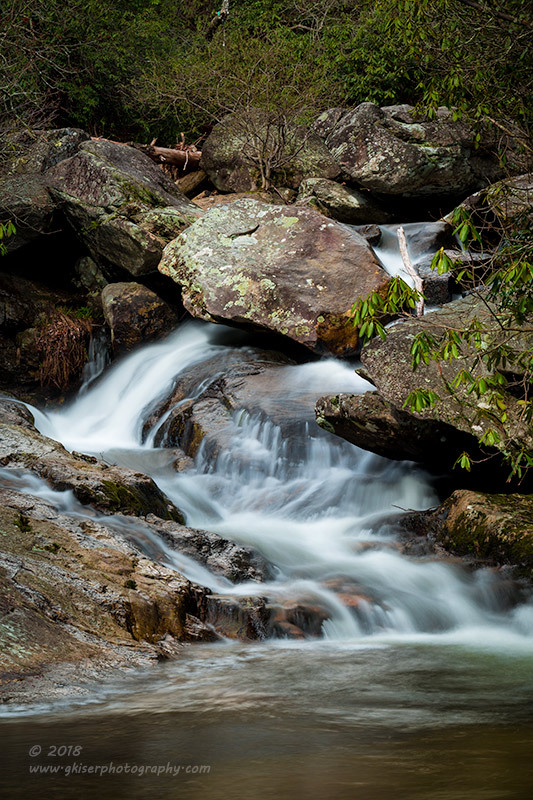 I did continue on to the next creek which was Widow's Creek, near the waterfall that has the same name. I had photographed this section many years ago, and have yet to find it with enough water to make it truly interesting since. This time was a bit different. There was a nice row of rocks stretching from coast to coast that I was able to work some compositions out with. I kept my 70-200mm lens attached, and tried to keep it angled down since it was snowing pretty good now. With the Polarizer attached, I was unable to use the lens hood, so keeping the camera pointed down was the easiest thing to do. Fortunately, I found so many great things to work with in this section. What I found so interesting about these rocks was the rich colors that they had. The snow and rain falling kept them all glistening wet so that the tones were all nice and even. 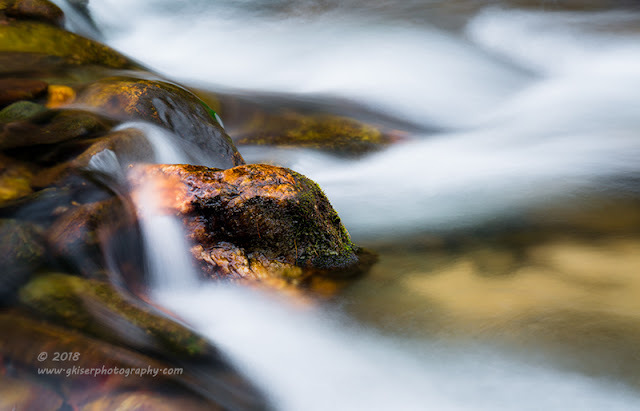 I was able to shoot quite a few isolations with the moving water. This was when I really felt like things were going my way. The snow had changed over to rain, and it was slacking off a bit. I knew that this was my opportunity to get over to the waterfall and start working it for a while before wet stuff started to fall once again. I had high hopes for this, and as I got close I could tell that the water was flowing very nicely. Unfortunately, it was also starting to flow from the sky as well. The rain had picked up again. I went ahead and fitted my 24-70mm lens as it has the lens hood to best protect the front element from rain. 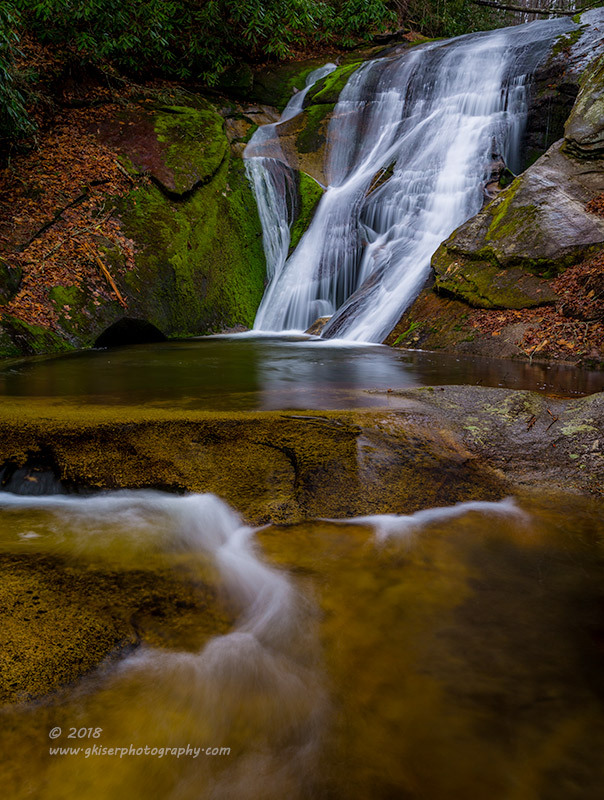 It is also the most versatile lens I have when it comes to waterfalls. 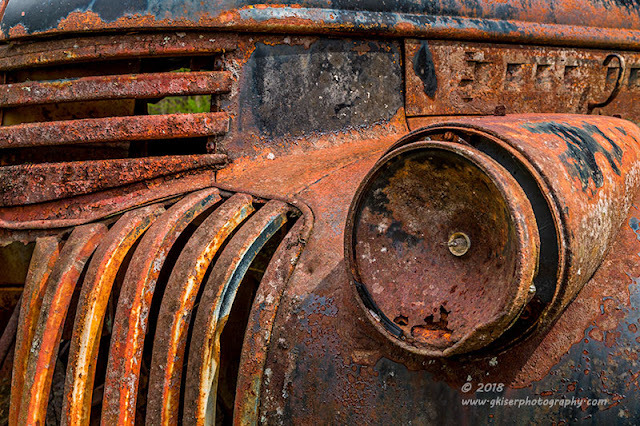 I had wanted to use my 16-35mm, but the hood was too shallow and I was sure to get water drops on the front element. With my Color Combo Polarizer attached, I started to look for compositions. 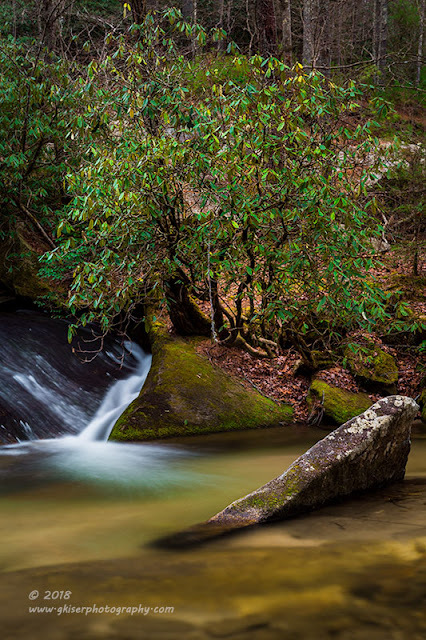 There were two branches in the way of the shots that I wanted to take, so my first task was to work my way close to the waterfall in order to remove the limbs. I think that the water was deeper than I thought because my feet actually started to get wet in my boots...but the limbs were cleared out of the way quick enough. While I was up close to the waterfall, I decided to get a shot. I found a swirl forming in what would become my foreground. The amount of water sliding down the rock face was pretty impressive for this waterfall. Short of floods, this was the most I've seen here, and I liked it. I was having a very hard time keeping the glass dry though. I was using my hat to cover the element, but with the ballhead dripping wet, the camera was hard to fine tune with one hand. I decided to give up on this location and move under some trees in the hopes that I would be shielded from the rain a little. From this point, I was a little better able to keep the glass clear. I was in familiar shooting grounds from here and knew the compositions that worked. I made little adjustments to get the waterfall positioned just where I wanted it to go in relation to the runoff cascades downstream. Something I've always loved about this waterfall is the small little scoop on the rock face to the left. I was not happy to see that somebody had come and scratched graffiti onto the rock around this hole. It really detracted from the scene, and was enough reason to allow me to do a little cloning to get the evidence gone. It seems that more and more, these places of natural beauty are becoming targets of vandals. Sure, they are doing it in good fun. I've carved initials in benches before as a young man, so I'm not alien to the concepts of why it is done. However, putting initials and messages right next to a waterfall is something else entirely. I've seen it at several different falls over the years and it really ruins the beauty for the rest of us. I do wish that there was a way to stop this from happening, but it is just too easy to be unwatched at these places. I'll get off of my stump now, and get back to the photography. 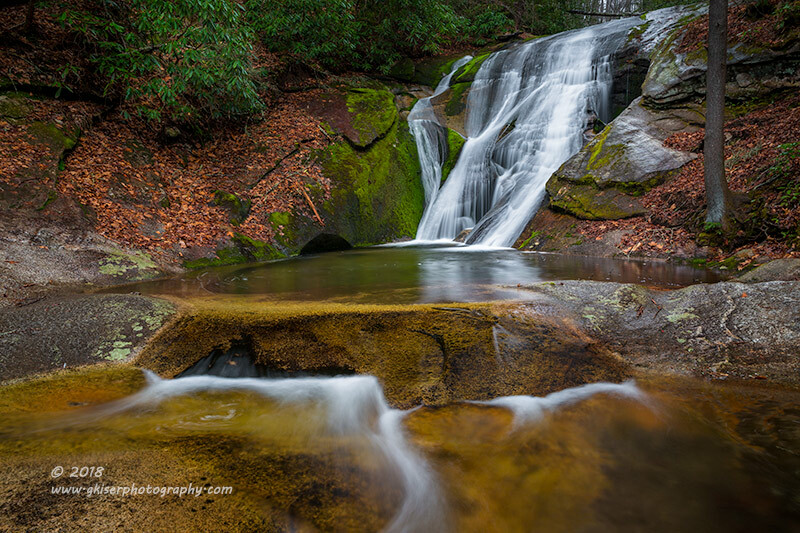 I was having fun with this waterfall, but the rain was now very steady, and myself and my camera were dripping wet. I had even put the rain cover on my Lowepro bag, and had started to utilize the rain cover for the camera. My problem was keeping the front element clear, and the rain was starting to soften the images I was shooting. It was time to pack it in and give up for the day. I had been rained or snowed on since I had gotten to the park, and it was getting a little old. I packed up the camera and started the mile walk back to where the truck was. There were a couple of places that I wanted to shoot on the way back when the sun was a little higher, but with the rain falling like it was that wasn't possible. The closer I got to the truck, the more the rain was starting to become snow. It was pretty, but it was also about five hours early according to the forecast. I was getting pretty close to the truck, but happened to look over to the right. 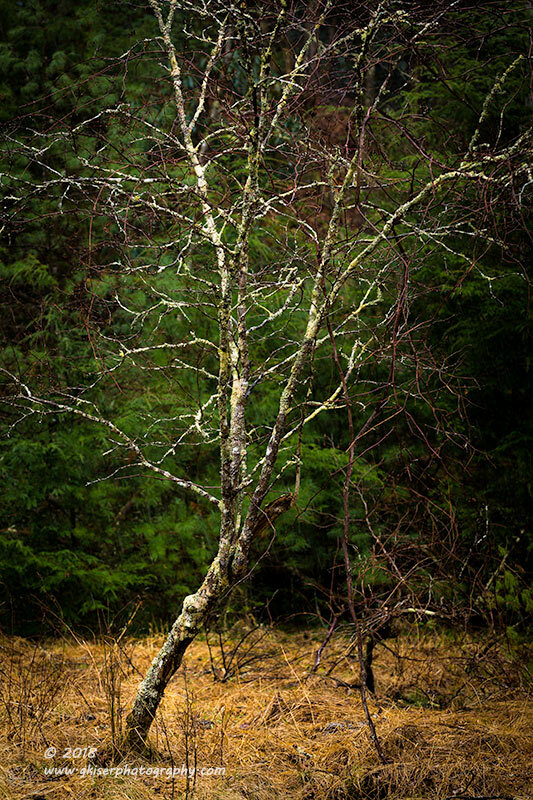 There was a bare tree set away from the background. It really stuck out because of the color of the bark, so I thought about how I could shoot it. The snow was falling pretty heavy at this point, so I was going to need a lens hood to cover the element. For this composition, the 70-200mm lens was best suited, and it had a very deep hood. The trade off was that I wasn't able to use a filter since my filters are a slightly bigger size than the diameter of this lens. Well, I could do this shot without a polarizer well enough, so I fitted the long lens and worked on putting the composition together. With a narrow depth of field, I was able to focus only on the tree and not the background. This turned out pretty good, and the colors all complemented each other. I only got three shots before the snow turned back to rain again. With a fairly short shutter speed, you can actually see the snow streaking across the image. It doesn't really show up in the low res web version though. With that tree completed, I finished the walk back to the truck and tossed the soaking wet equipment in the back and hopped in the front seat. I was cold and wet, but thought that I had a pretty good amount of shots for the morning. I had just under 100 frames shot in the three hours that I was at the park, but I didn't feel like I was finished with the day. I still wanted to shoot more, but the rain was telling me otherwise. I did know that Winston was supposed to get the weather much later than the mountains so I decided to take the scenic route home and try to get in front of the heavy rain. I waited until I got into Yadkin County and saw that the rain was almost non-existent. That was where I branched off of the highway and went through Yadkinville. I'm one of the best people I know when it comes to getting lost in the country. I have no idea where I was when I came across what looked to be a car grave yard of sorts. Wait, no....that's not a grave yard. Those are rat rods on the property. OK, that is cool, and it wasn't raining more than a drizzle. I got turned around and pulled off of the road. There was a house, a workshop, and a long driveway leading to another house that all looked like it was connected to this property. I could have gone and knocked on some doors, but I was rushing the weather. I opted to get what I could from the road to save time. 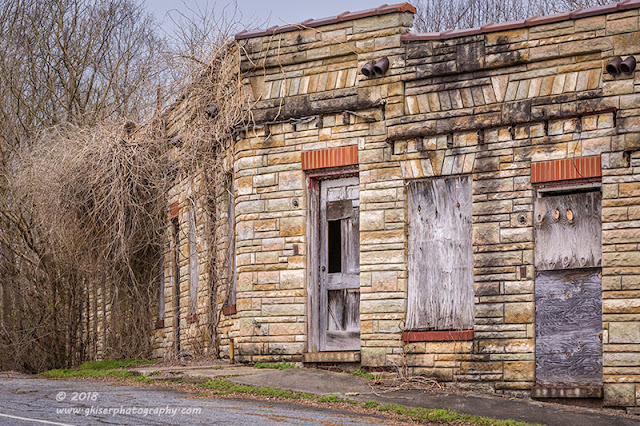 This was a really cool property to find! In addition to the rat rods, there was a really nice fire truck parked next to a barn that caught my eye. Both of these scenes were within reach of my 70-200mm lens which I pulled out of the bag. It was still rather damp from Stone Mountain, but functioned perfectly. I didn't use any filters because it was raining enough that I needed some sort of covering on the lead element. I got into the best positions that I could in order to capture the scenes in front of me. 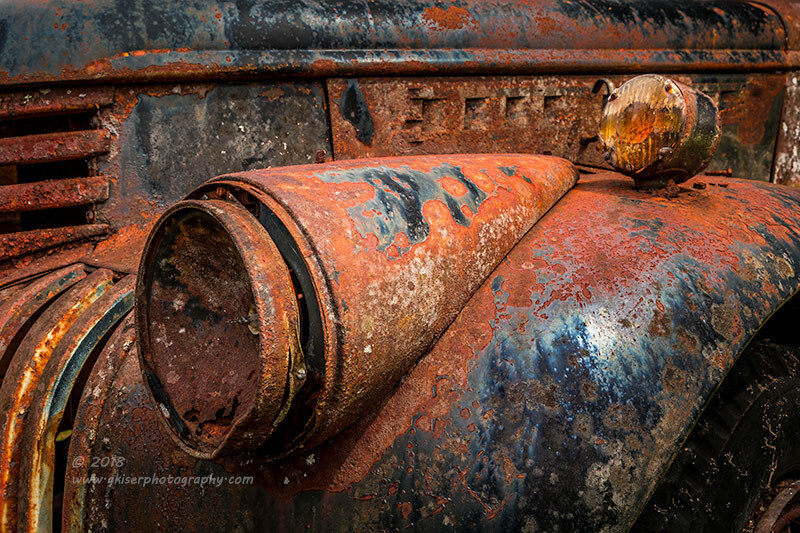 The rat rods were simple and straightforward to shoot. The fire truck was a little more complicated due to its position. Ultimately, I decided to create a panorama to include the barn as well. I shot a series of 6 shots which were later stitched together in Lightroom. 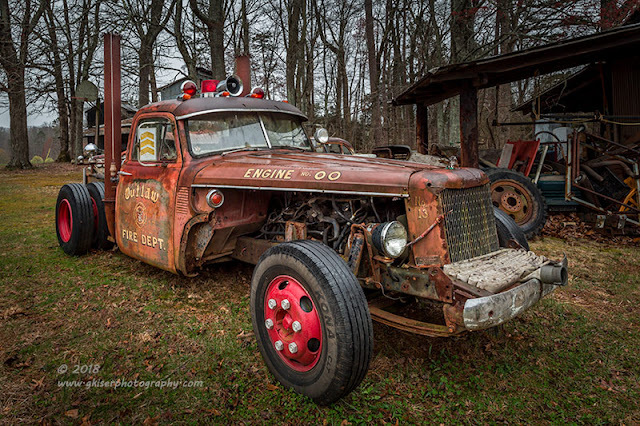 I then pulled two of the images back out and stitched them together once again to create a single image of the truck by itself. That is the nice thing about panoramas, they have so much image data that you can crop them all sorts of ways and maintain a very large file to print from. 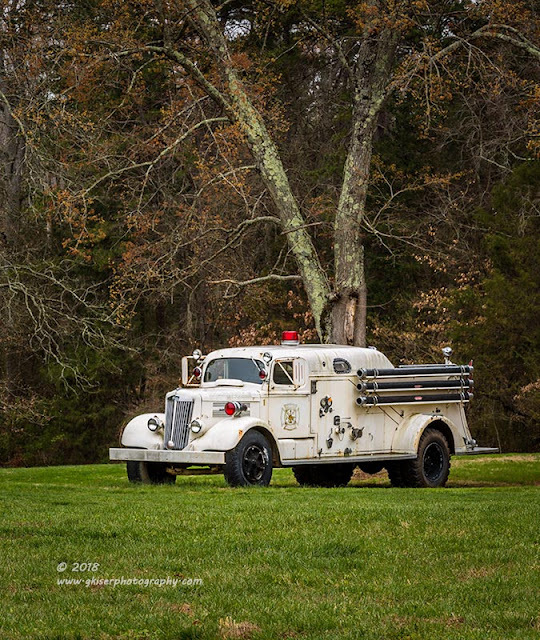 The tree behind the truck was very interesting on its own, but seemed to work well to highlight the firetruck. When I was done with the panorama, I heard somebody coming out of the shop. I was expecting the typical "What are you doing," followed by "Get the hell off my property!" routine. Instead I was greeted by a very nice man who invited me to come on in closer to photograph what I wanted. 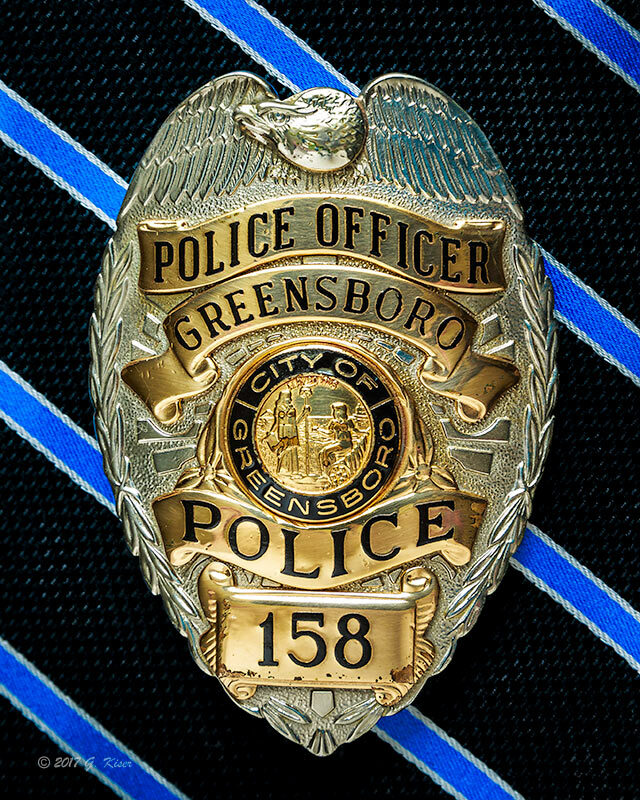 This was a nice turn of events, and seems to be the case with folks in Yadkin County. 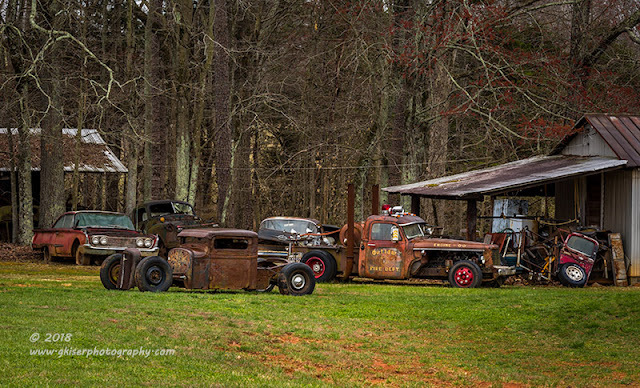 I chatted with him briefly, and found out that he built rat rods using the cars that were on the property. He had been doing it for about eight years now, and had completed 38 builds, some of which were shipped out of the country to clients. I went back to the truck and swapped out my long lens for my 24-70mm and a polarizer. I was so excited that I forgot to put in a new battery which was getting depleted quickly at this point. I was like a kid in a candy store, the only problem being which car to shoot first. 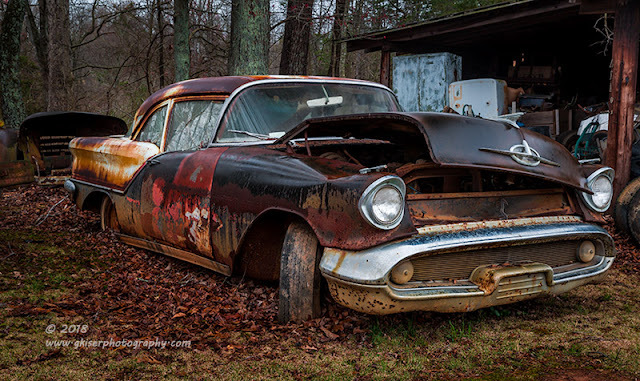 The first subject to be placed in front of the lens was this Oldsmobile. It was in sad shape, and there was a lot of clutter behind it as well. The patina on the door and quarter more than made up for the extra clutter. There was a large dent in the fender and the hood was bent from rusty springs it appeared. It all worked together to remind me of a person with a quizzical look and squinting one eye. Yeah, this car had personality for sure. I still thought that the best part was the quarter and door. 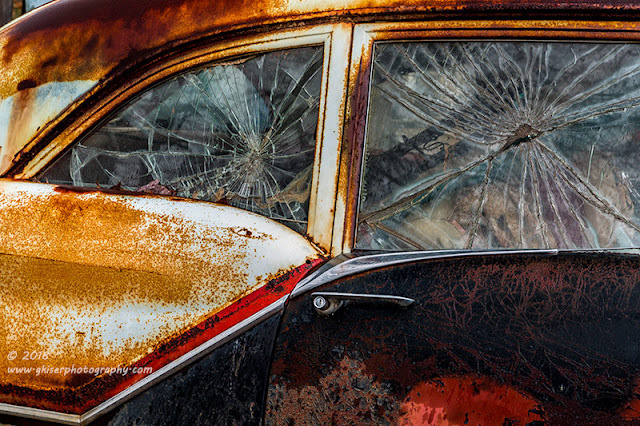 When I realized that both of the windows were shattered, I really became interested in the side of the car. I decided that this needed an abstract approach, and I framed it up capturing both windows as well as the strong diagonal between the white and the black with the chrome molding. This image was something special thanks to the way that the glass looked. I could not have asked for any better with this car. But I could have asked for better from my camera which was now on fumes. The battery light was red and blinking at me now. I only had one option, to go back to the truck and grab another battery. As the rain was starting to fall a little harder, I went where I could find some shelter. That shelter happened to be right next to a Chevy truck cab. I figured I would work on a composition with this old truck for a while. There was a lot missing, but it sure did have a lot of character to it. The part that really caught my eye was the grill. It wasn't a flashy grill, and actually seemed rather unimpressive, but the design of it begged for something. It just took me a few minutes to figure it out. 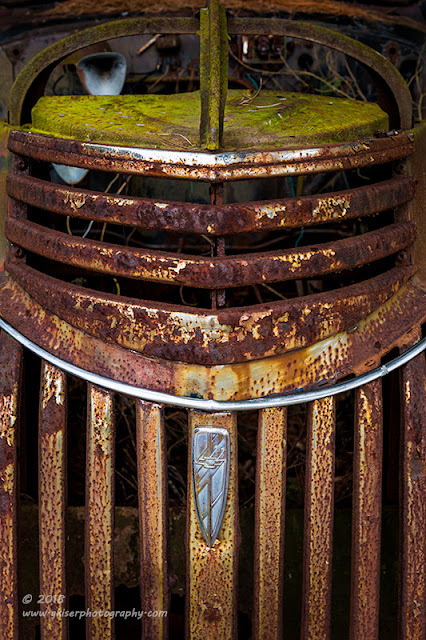 What the grill was begging for was an isolation that captured the different directions of the slats as well as the Chevy emblem. The moss at the top made for a great color balancing element, and the repeating shapes were absolutely awesome. If you look close enough, you can also see where the engine should be, but instead it is just vegetation. That adds to the mystery of what you are looking at until you have time to study it. This is actually one of my favorite images from this location. It is just cool the way it all plays out. The rain started to ease up once again, and I started to make my way around the property again. I had been looking at an old GMC truck for a while and decided that I would go and give it a closer look now. It was in a row of four trucks, and the one next to it was pretty interesting as well. I tried a group composition and reduced it to just the two. None of them seemed to work out the way I really wanted them to. What I ended up doing was shooting from the other side of the truck and capturing the moss on the side. It was a pretty straightforward shot and wasn't all that spectacular, but I did like how the truck looked in the rain. It was also odd to see an inspection sticker with eights all the way across. 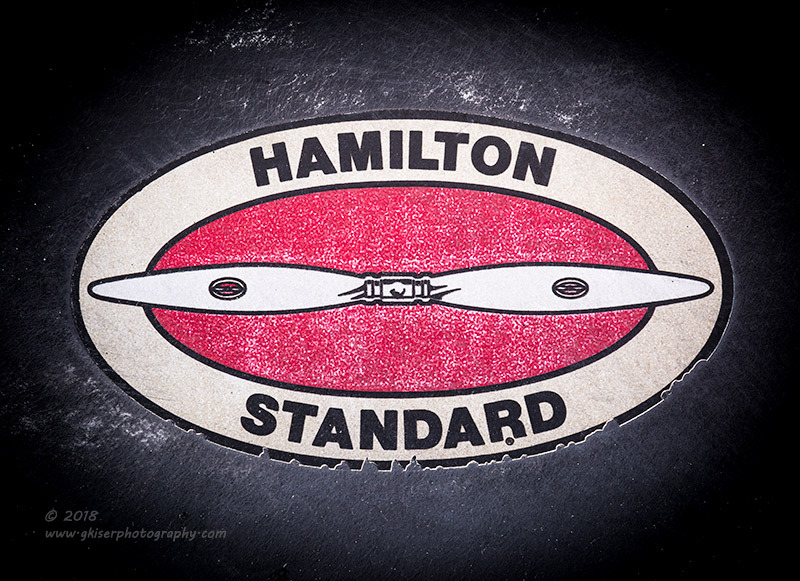 it was a fun little picture to make, but what I found on the truck next to it overshadowed this image quite easily. 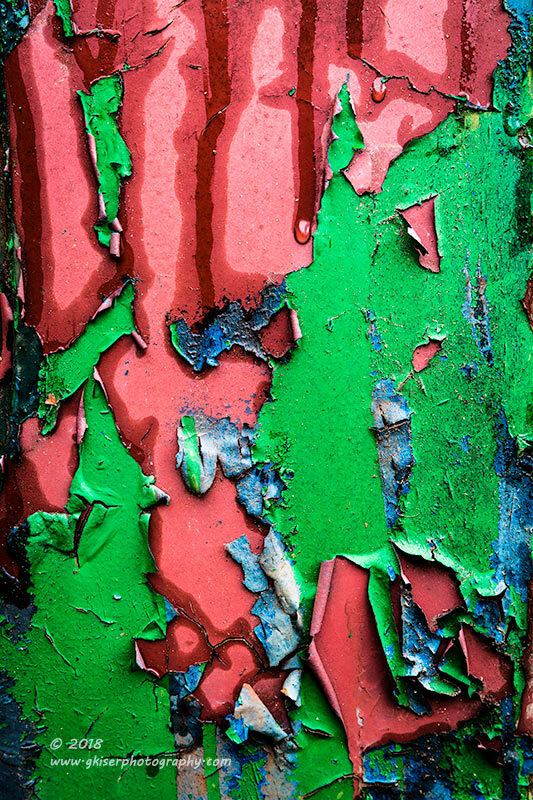 The truck was pretty cool, but the different layers of paint were all peeling which made for a very interesting abstract opportunity. As I started to look at the different patters I could shoot, I started to see where the rain was dripping down the side of the truck. It almost looked as though it was crying. On this section, there was a bit of blue which helped to balance out the red and green. The rainy tears were at different stages, but I was able to capture one as it was actively moving down the side. That was just what I was after. I had texture, color, detail, and emotion. This was a very cool shot, and I managed to get it in one exposure. Now I was really looking for color having found this treasure trove of hues. My next subject was about 50 feet from where I was standing. 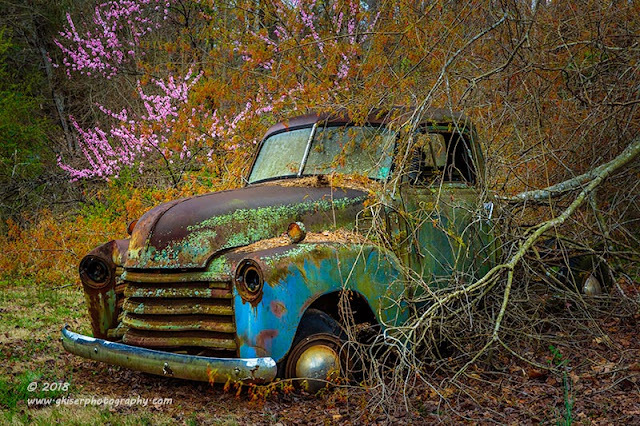 It was an old Chevrolet tucked away in the weeds. I did notice that the trees were blooming behind the truck, and the blooms were a perfect pink. There were also burnt orange blooms mixed in which made for the perfect backdrop for this truck. When I got in position to shoot the scene, I noticed that the fender was mostly blue which made for a perfect complimenting color to the pinks and oranges in the trees. While the color is not quite as brilliant as the previous picture, I have to say that this is one of my favorite images from the day. I've found that I really enjoy photographing these derelict vehicles in Spring with all the vibrant colors and new life. The dichotomy is just too perfect. I shot a few different exposures of this old truck, but with the rain really staring to come down, I decided that it was time to get a few more subjects under my belt before I lost the opportunity. I went back over to the rat rod side and started to look at the one completed rod situated in front of the barn. I had a lot of issues with exposure on this one since I was going to have to include the sky. 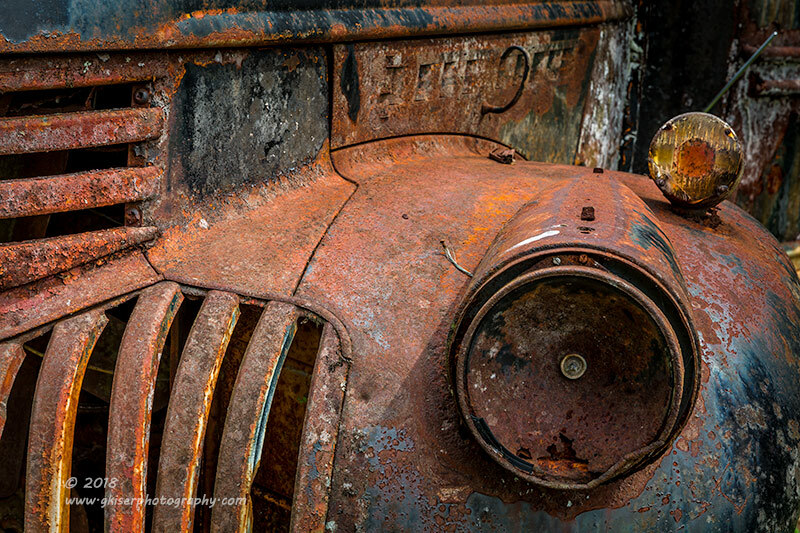 I decided to get in close and skew the perspective to compliment the feel of the rat rod. This thing was a work of art. 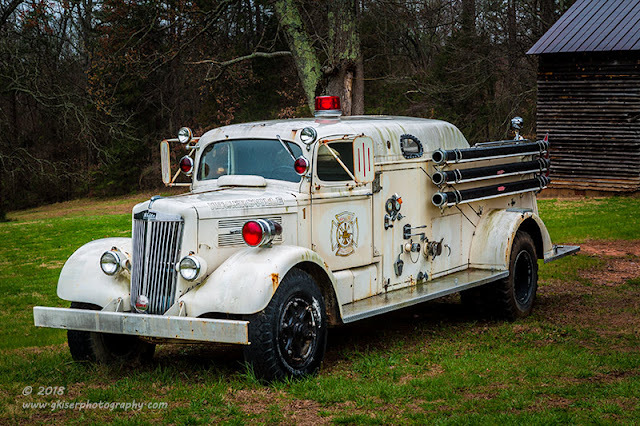 The stretched nose on it, with the wrapped fire hose in front of the grill was just beyond awesome. It came fully equipped with lights and a siren it appeared, and I'm sure it could get to a fire in a hurry. The gentleman that owned the shot really knows what he is doing. I was able to capture the wide range of exposure with a single capture even though I was prepared to shoot an HDR image in order to capture the wide range. When I got done processing it, I think it has jumped to the top of my list as my favorite image from the day. The splashes of red, the patina, and the overall look of this rig were such a fantastic combination. It has actually sparked an interest in rat rods that wasn't aware I had on that level. I could see me driving one, and I could sure see me photographing more of them. I puttered around on that side of the yard for a bit. I found a few isolations to shoot, and started looking for things that I could come back and photograph at a different time. There is really no end to the possibilities out here, and I see myself coming back many more times. I wouldn't even be opposed to shooting marketing photos of his work. I swear...the things that I find when I go out and get lost! The rain was getting worse and worse now, and I decided that it was time to break stuff down and get back in the truck. As I was walking back to the truck, I went past the big white firetruck that had caught my attention earlier. I decided to give it another try with a different composition. I got myself positioned so that I had a minimum of distraction in the background and made the exposure. At this distance I didn't have the tree in all of its splendor behind the truck, but I was able to get a bit more detail rendered here. This is one of Mr Cornelius' next projects and I can't wait to see what he does with it. He's got a bagged Cadillac in the back of the shop that was under a tarp that I would love to see more of as well. As I said, I have plans on returning to this location, and I hope to get the opportunity to photograph more of his projects in different locations. For today, however, my time was finished. The rain was now very heavy and it was getting difficult to stay dry. I packed it in, with a total of 157 frames shot for the day. Of those, these 23 stood out from the crowd and made the cut. I really had no plans to go out this weekend with the camera. It was going to be a restful weekend at home for a change. However, the clouds kept tempting me to go out and shoot a cargo plane that was apparently in for repairs at Smith Reynolds Airport. I've been watching this plane for several weeks now and have been trying to figure out the best time and way to shoot it. I had pretty much settled on a long exposure set either in the blue hour with a good bit of light painting, or during a windy day with the clouds moving across the sky. I was trying not to shoot it in the typical fashion during the day. The problem was, the clouds were never cooperating with me. They weren't right in the blue hour to get the right kind of definition in the sky with the long exposure. They weren't moving quick enough to work for a long exposure shot during the day. I was really starting to question if my ideas would work at all before the plane moved. I'm not sure how long it stays, but remember that it does come about once a year or so, and stays for a bit. With it being 3-4 weeks already, I was working on borrowed time. Something that I know about my photography is that once I get the idea to shoot something and start really planning it out, I can't focus on anything else until I get some compositions under my belt of the particular subject. That was quickly becoming the case with this plane unfortunately. I was just not interested in shooting anything else since I had been thinking about it for quite some time now (plus the previous year when I thought about it). The plan had been to possibly wake up around 5am to get to Smith Reynolds well before sunrise. Both mornings the clouds were supposed to be pretty decent for what I was looking for. When I woke up both mornings, the forecast had changed and the clouds were just not right for my ideas. Saturday had some great clouds, and for about 15 minutes they would have been perfect for what I wanted, but I wasn't there to take advantage of it. When Sunday morning rolled around, I was watching the clouds start to break up around 10am or so. This was getting dangerously close to the middle of the day when I try not to do much photography. I was really starting to look at the chances of everything really lining up to fit my previsualization on this aircraft. It was looking like a long shot which was probably not going to happen. I weighed that against the fact that this would be the first plane that I have photographed which would be cool all by itself. There were things that I could do with this subject that would be different without the need for the light painting or long exposure. With Toni's help, I decided to head out to see if I could get something to work with the plane...with hopes that it was still there. As I approached the hanger where the plane was located, I didn't see it at first. I was really figuring that my luck had struck again and I missed it by thaaaaat much. But I just had the wrong angle, as I got closer, I could see the wing. It was still there, and nothing was parked near it. I pulled in and grabbed my gear. The sky had some very interesting clouds that would be fantastic with a long exposure. I started to get excited until I found a fixed object and watched. The clouds were not moving fast enough to really make a long exposure shot worth the effort. I started to look at things differently to see what I could do to make the images stand out. With the size of what I was looking at, I really wanted to emphasize that aspect in my compositions. The best way of doing that was to go wide with my lens choice. 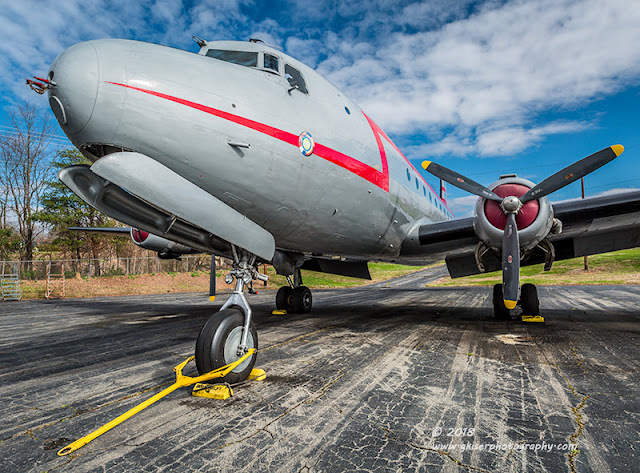 I opted to go for broke and fit my 16-35mm lens with a Singh-Ray Color Combo Polarizer to make the sky pop and remove extra glare from the aircraft. I started working on compositions and was immediately happy with my lens choice. It was perfect for the compositions that I was wanting. The more I worked around the plane, the more I started to learn about it. There was an insignia on the fuselage that indicated that it was part of the Berlin Airlift Historical Foundation, honoring "Operation Vittles" from 1948-49. There were other insignias on the side referencing "Berlin Airlift" and "Spirit of Freedom". It was obviously a post WWII aircraft that was set to bring supplies to the divided Berlin at the beginning of the Cold War. I imagine that this plane has been restored and is being used as an homage to that part of history. History aside, there were a few things that really drew me to this aircraft photographically. First of all, it was accessible. I didn't have to get any special permission to get close to it, and there wasn't too much clutter to worry with around it. Second, the red design on the side was quite eye catching on the pale gray paint. 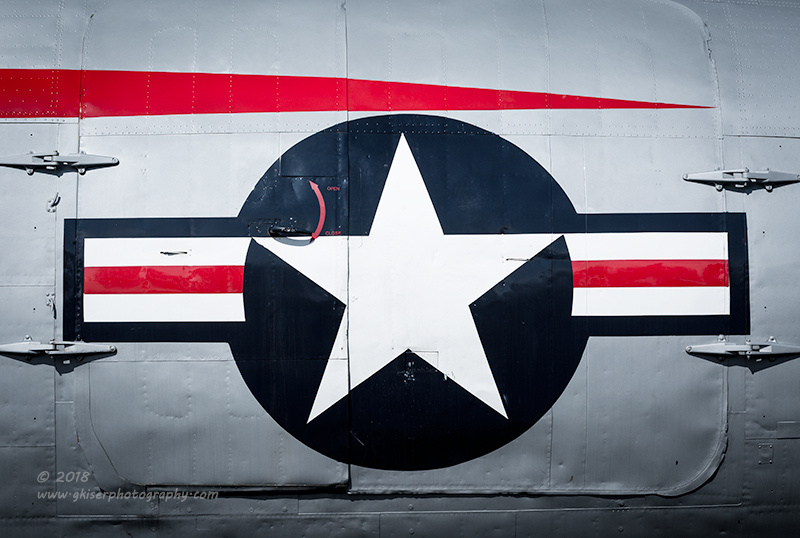 When mixed with the blue sky, the red stripe provided a great color balance to the scene. 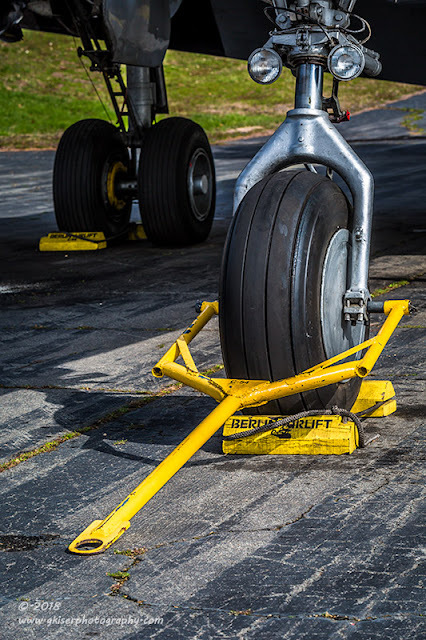 Speaking of color balance, the tow bar on the nose gear was a bright yellow as were the chocks. It was just a few more splashes of warm color that helped to make the image really jump off of the page. The main thing that really drew me in was it was something completely different from anything that I had shot before. 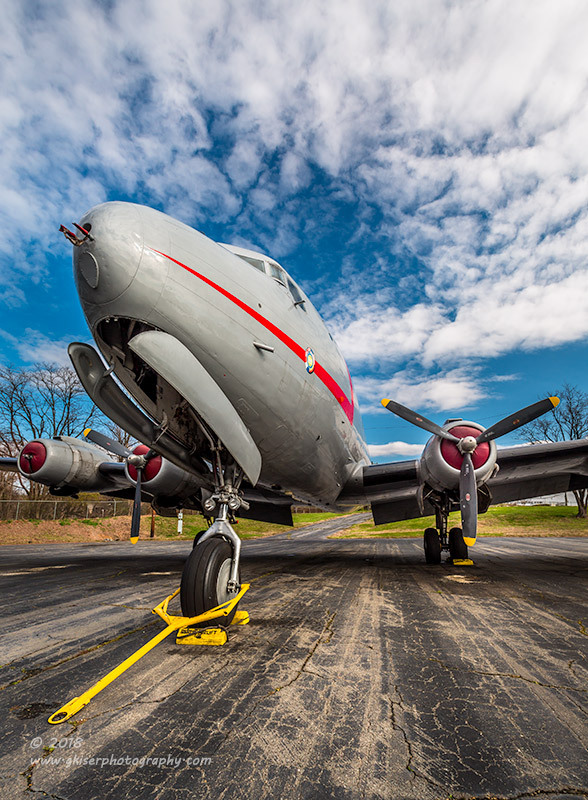 I've always had a love for aircraft, but they just don't pop up that often in the open where I can photograph them. Sure I could go to airshows, but there is just so much of an exhibit feel to that setting. This was a lot more organic, and fit with my themes in photography. It was in a natural setting, and I was able to shoot it as I found it. I was also able to get in to shoot some isolations which I thought were pretty cool. 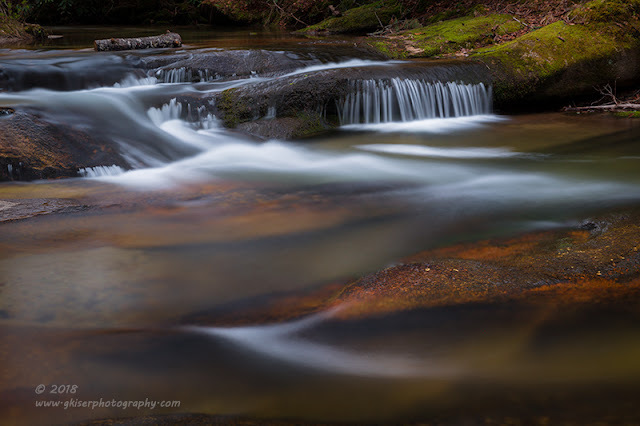 Color is a strong consideration in photography, and if used correctly, can really define the image. An example of that is the picture above. The subject matter is the landing gear of the plane. All by itself, not all that interesting. However, when you add the strong leading line of the bright yellow tow bar, balanced with the yellow chocks and brake ring; the image comes alive. There are also two other aspects which make this image . The strong diagonal lines of the pavement that compliment the tow bar help draw your eyes though the frame. 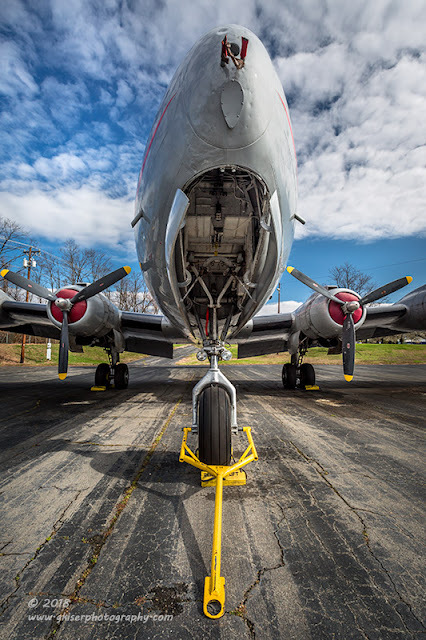 The landing lights on the nose strut gives your eyes an upper boundary to keep them from wandering out of the frame. It also gives the picture a little bit of personality as the dual lights anthropomorphize the subject. I found myself working the plane in two distinct processes. While I started with my super wide angle lens, I also spent time using my 70-200mm lens for some of the isolations as well as trying to compress aspects of the compositions. In the end, I found that I liked the larger shots with the perspective distortion better than the compressed compositions. They were much more dramatic as I had thought that they would be. The long lens did give me the ability to shoot a lot of different compositions that captured bits and pieces of the story. While I was working the plane, I was looking for some black and white compositions since that is one of my favorite things to do with clouds like this. The intention was there, but when I started to process the images, I just couldn't bare the thought of losing the red, yellow, and blue that gave the image life. I had shot it well as a monochrome, but it just fell flat in the final presentation. The way that the colors all worked together in these images was just too important to the compositions. I especially liked how the pavement was looking with the parallel lines from age. The longer I was out there, the more and more I was getting excited about this subject. It is good to go out every so often and work outside of your comfort zone for a bit. I've been pondering how to shoot this plane for about a year now, and have come up with all sorts of ways. Of course, my plans haven't quite worked out, but I don't care. 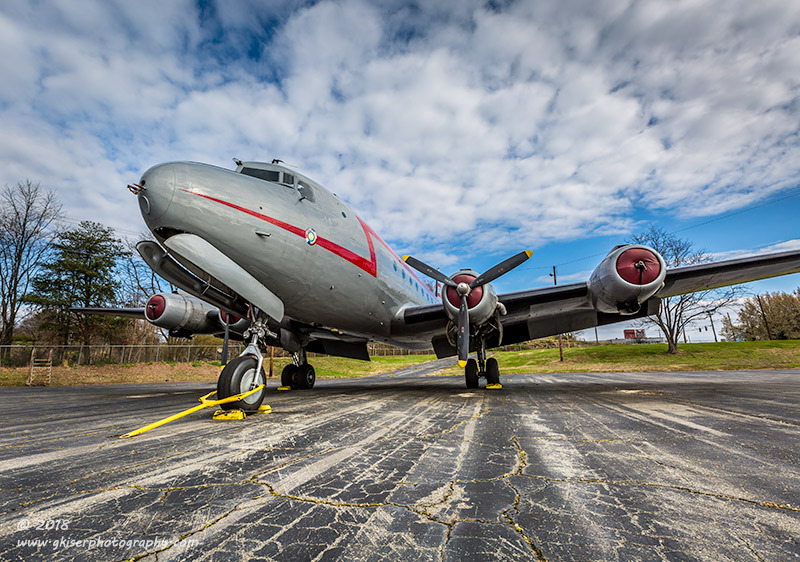 The hour or so that I spent out there shooting this aircraft in the late morning has been completely energizing to me. I've finally taken my chance to work this subject and now I feel like I can move on to something else. I've also learned a little bit more about who I am as a photographer, and what I am capable of. These are all really good things. One thing that I really love about photography is that once you get the foundations on what makes a good picture, you can apply they to all sorts of different subjects. As I do with all of my subjects, I stopped and listened to how it wanted to be photographed. It took a while to hear because I wasn't sure how anything would turn out. When I reduced it all down to color balance, dynamic compositions, and perspective, it just became about photography once again. 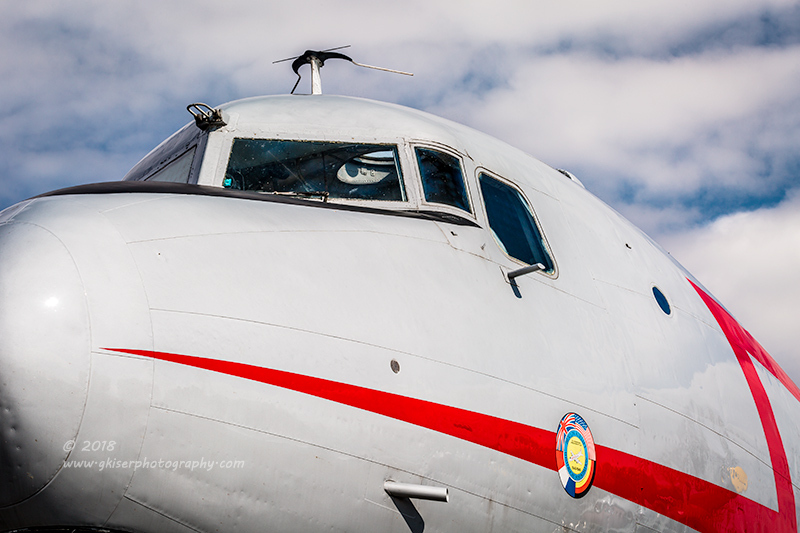 I am really glad that I took the chance to photograph this old bird today. It was well worth my time. 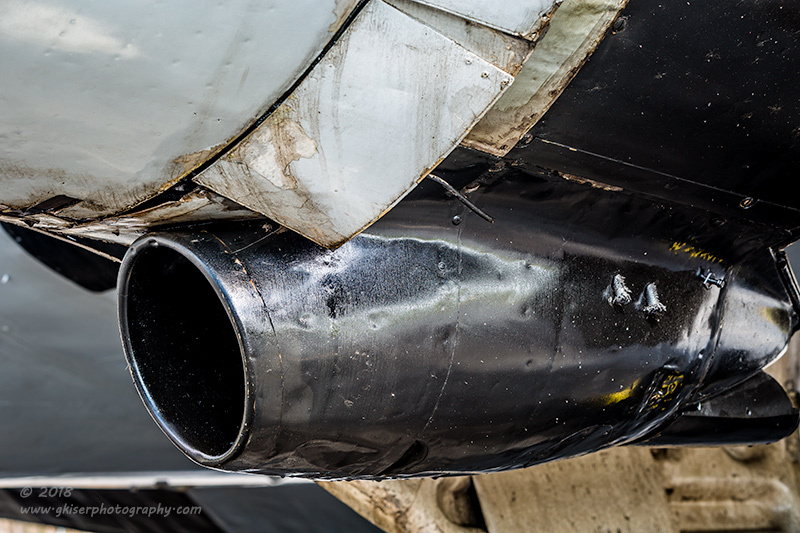 The problem is, I want to shoot more planes now. It was just that much fun! The story goes like this...Toni was at work, Sierra was at a friend's house, and the weather was cloudy, with a good chance for a great sunrise. How much thought did I put into whether or not I would be playing with the camera? Not much, not much at all. I did however, put a good deal of thought into where I wanted to go. My first thought was Wiseman's View in the Linville Gorge. With the possibility of a good sunrise, that would have been a good option, but if the sunrise failed, I wasn't guaranteed good clouds for landscape work. Plus, I really wanted to wait until Spring to start doing mountain landscapes again. The weather was going to be great for waterfalls, but quite frankly I was getting a little worn out on waterfall work. 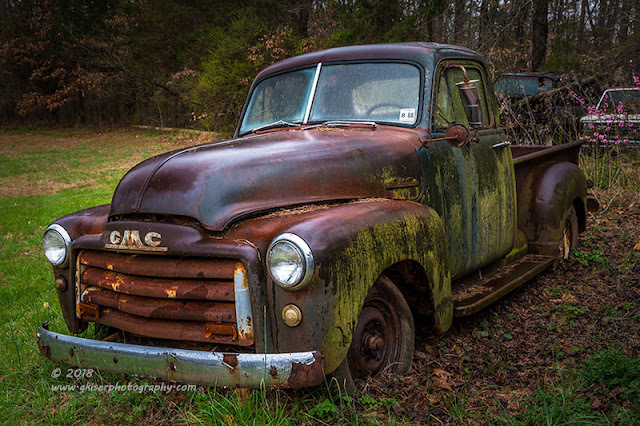 I was really wanting to do some barn photography, and maybe find some old cars to shoot. 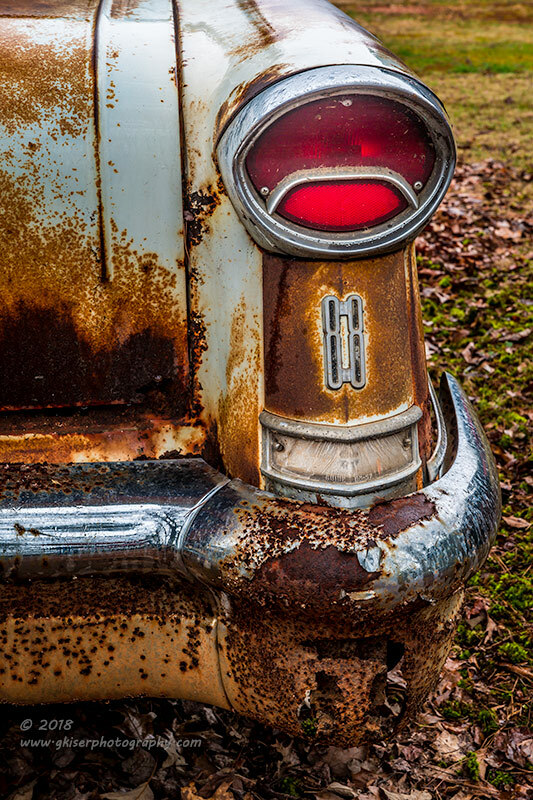 I tossed around my options, and considered the few cars that were close to me that I still had not photographed, but decided that those were going to wait until the trees filled in to block the background clutter. 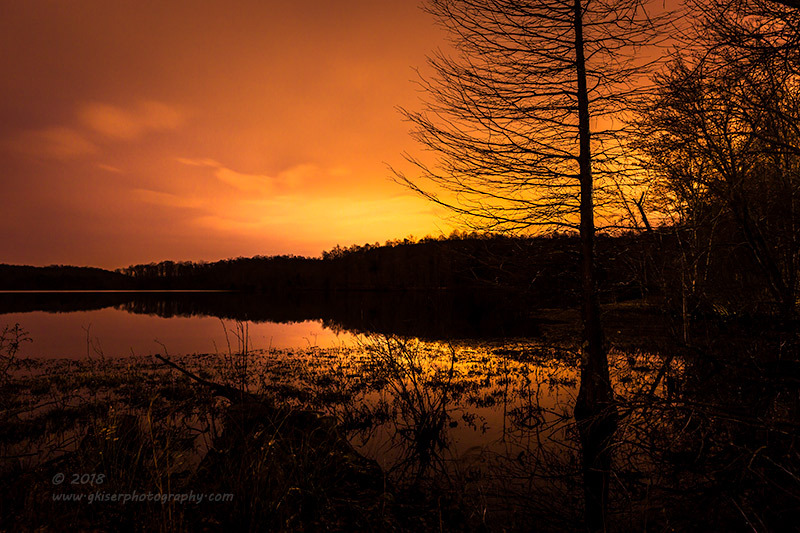 Just in case the sunrise wasn't all that great I decided to stick close to home and go to Salem Lake. After that, I was going to go on a road trip to the North. I didn't really have a destination in mind, I was just going to drive. My morning when Toni got up to go to work. I checked the weather and it was pretty much the same. The hourly forecast was calling for clouds and some rain, while the sunrise forecaster was calling for a pretty good showing of color. I weighed my options one last time, and got rolling with Salem Lake as my intended first stop. Leaving at 5:15, I got there in plenty of time to capture all of the different transitions of sunrise. I got myself set up near the playground and picnic area facing where the sun should be coming up. I chose to use a spindly tree that was actually in the water as a point of interest for my visual anchor. I opted for my 24-70mm lens so that I could capture as much of the sky as I could while still keeping the distant shore in proper scale to where I was. I didn't add any filters, but I did screw on my Lee filter holder in case I needed a grad filter. I started doing some test exposures at about 30 seconds, to see how things were looking. There was a bit of faint color in the sky for these test shots, but nothing like what I was expecting in the next 15 or so minutes. The exposures were showing more color in the sky than my eyes could see due to the long exposure. It turned out that those test shots were the only ones I was going to get with any color. The clouds were just too consistent with no breaks in them for the sun to shine through. This is the first time my sunrise forecaster has been wrong. At least I didn't drive 2 hours away to get this sunrise. On the plus side, it was quite out there except for the birds chirping and the geese honking away. It was rather relaxing after a long week at work. I went ahead and packed up the camera and walked back to the car. I didn't really have a destination in mind, but started heading back towards home because the radar showed that there was rain about to hit. It didn't, and I decided it would be safe to venture on down the road. 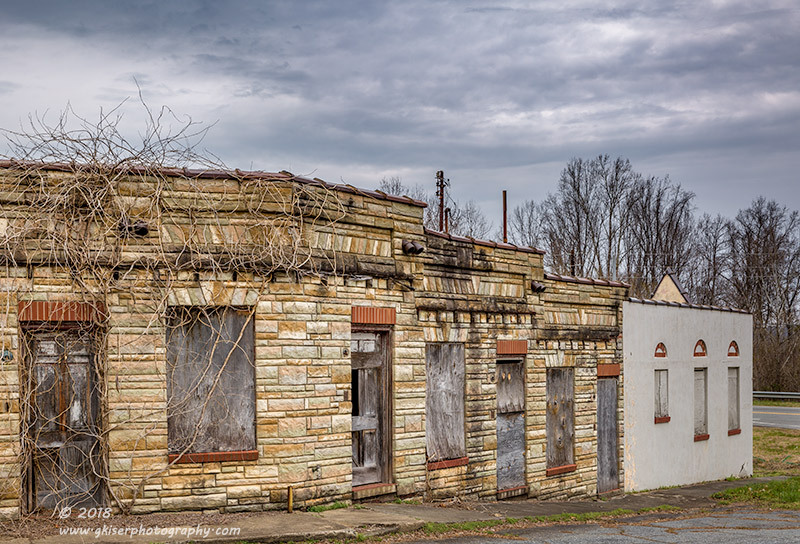 I went on through Walkertown, and up into Stokes County for a while without finding much that I wanted to photograph. I was getting more and more lost, and found myself entering Rockingham County eventually. Historically, I have had good luck in Rockingham so I was pretty excited about the prospect. The funny thing was, I was seeing barns, and even some cars but nothing caught my photographic eye. It was all just too mundane and stuff that wasn't appreciably different from the other images I've shot over the years. I was looking for something different...something exciting. The problem with different and exciting is that those opportunities don't present themselves that often. I'm pretty sure that I was on Hwy 770 and I came upon this nondescript hotel on the side of the road. The office was a white building with a broken out door. Nothing special to look at. Then I went past it and saw the actual hotel part behind the office, WRAPPING its way around the intersection. It was stone, and the rooms were all boarded up. It was interesting, and unlike anything that I had photographed before. It was different and it was exciting! I turned down the street real quick and pulled off the road. I grabbed the camera and got set up next to the building that was covered in vines. 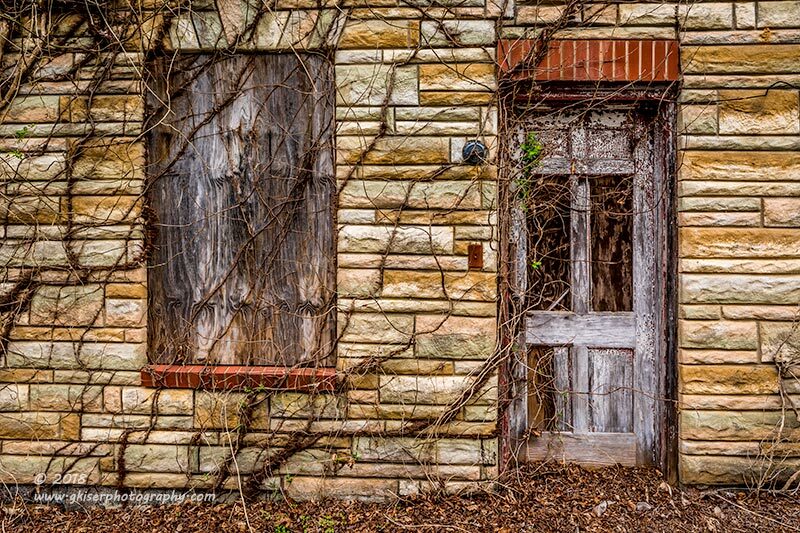 There were so many textures with the plywood, stone, vines, brick, fixtures, and existing wood. This was what I had been looking for all morning, I just hadn't known until now. Just as I got the 24-70mm lens attached and mounted to the tripod a car pulled over in the "parking lot" alongside the road. Uh oh...was I about to get kicked off the property? That was what I was expecting even though I didn't see the sign indicating that I couldn't be there (at least on the outside of it). A man got out of the car and started out with "I've got to ask...." which is usually followed up with ...what are you doing, and why are you on my property? Well, that was not how his statement went fortunately. He finished by asking "...what are you seeing that I'm not seeing?" He continued to tell me that he had seen several photographers out there taking pictures of prom couples and engagement shots. He wasn't seeing what the photographers were seeing, and was genuinely curious. I told him that there were so many textures here that would appeal to a photographer and the vines that were overgrowing the walls were just cool! I could see how this would be a fun backdrop for couples, but I was looking at it completely differently. 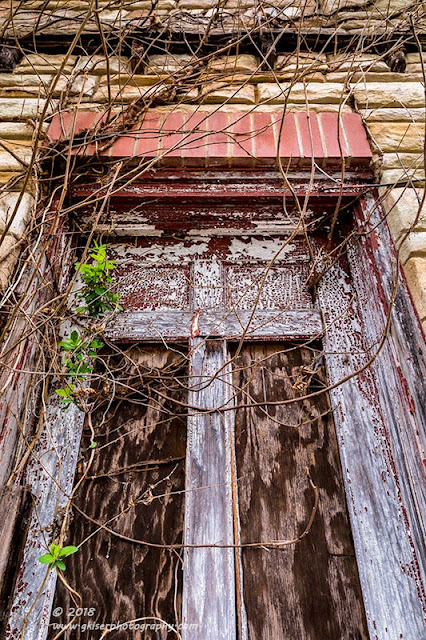 I was seeing lots of chances for isolations, and some door photography. I wanted to capitalize on all that I saw here. He introduced himself, and told me that the motel had been vacant for about 35 years. It was a jewel in the area in its time. He told me that its name was the Grogan's Tourist Court Motel. He suggested that I go around back to see the back side of the motel as well. That was already on my list! We chatted for a little while and then he bid me a good day and went on about his. 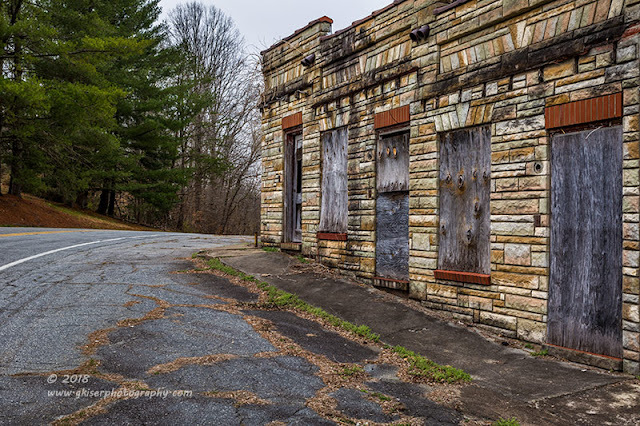 Now that I knew a little of the history of the place, I was really feeling excited about getting some images. There was a diner across the intersection which was still being used for a business, and there was another section of the motel across the street where I parked. I knew how they all fit together now, and that really brought the setting into a complete light for me. I was having so much fun working this motel, and I found myself switching lenses back and forth between my 24-70mm and my 70-200mm depending on the composition I was working. Since it was really cloudy, and there wasn't that much glass to worry about reflections, I shot bare with no filters attached. That made it very easy to swap out lenses. 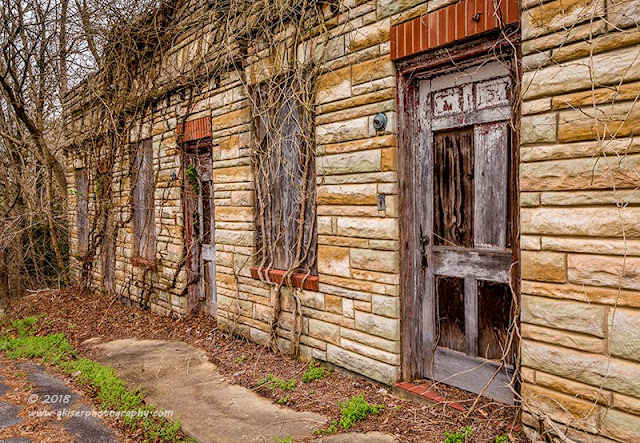 Each building had its own character, and the section across the street was of newer construction and painted white with red doors, and even garages attached. I could see this being a really high end motel in its day. 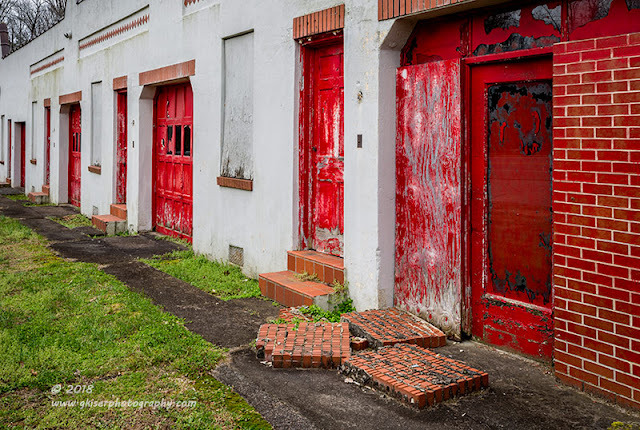 Of course the red doors caught my eye, and I had to get something to show those off. The colors were just so amazing out here, and the light was nearly perfect. While the colors were great with the warm tones on the brick and stone contrasting the plywood, I also had the opportunity to shoot a monochrome image on the back side. Earlier in this article, I shared Do You Dare which was one of the images I shot from the rear. It was the only one that I liked when I was culling the images once I got home. I was drawn to the repetitive patterns on the back wall. There was obviously a walkway missing for the upper floor which added to the questions the viewer would ask. There was a single door open in the lower right which I almost ventured in, until I saw the sign posted right at the door "No Trespassing". This wasn't the safest thing to do, and adding in the legal issue, I opted to stay outside, but the question begged to be asked "would you dare?" I mean the back side of this motel looks like something out of a horror movie to be quite honest. I was a little disappointed with the rear of the motel after having so much fun with the front. It was just too grown up back there to get in close to do much. I did continue shooting different compositions along the front of the hotel, and even managed to get several that showcased the wraparound nature of the motel. It might be silly, but I really liked that design element and that really made this motel unique, and visually interesting. 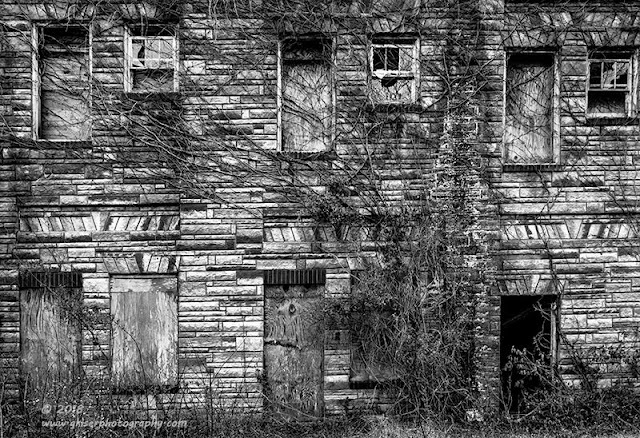 The stepped rooms added a diagonal element to many of the compositions which added to the visual tension within the frame. All very good things when shooting something that is essentially two dimensional by nature. I think I was there for about an hour and a half, although I really did lose track of time. It felt like about 10 minutes when I was all done. I went ahead and packed the camera up and got back on the road. I was still looking, but after the fun I had just had at the motel I wasn't really up for much else creatively. I cruised around and decided that it was getting a little late in the morning and I had better get headed back home...plus I was needing gas. I decided to let my GPS take me home since I really had no idea where I was at. I came down Hwy 220, back into Stokes County and then ended up on Hwy 65 back into Forsyth County. I was starting to get the itch to bring the camera out once again, but I was getting close to home at this point. There was one barn that I had photographed many years ago which set just off the roadway. What the heck, I'll give it a go. The last time I was there, it was full on Spring and the trees had already fully bloomed. I was a couple of months earlier this time, so I knew the trees would be largely bare which would make for a different feel for the photo. I found the barn just as I remembered it. I went ahead and pulled out the camera and fitted my 24-70mm lens with the Singh Ray Color Combo Polarizer to keep the glare off of the tin roof, and to help saturate the wood tones in the siding. I started off as I would normally do by taking full on shots of the barn. I did some with a tree as a foreground, and I did some up close and personal. They all seemed to have merit, but I was falling short of my want for different pictures today. The answer came in the form of my 70-200mm lens. I was going to get in close and do some isolations with the wood to show the textures and the aging of it. Of course, I kept the same filter attached as it does a great job at bringing out the colors. This was the ticket. I was now in a position to create an infinite amount of photographs from this single barn by picking parts of it out from the whole. I was looking for lines, and textures for these compositions. 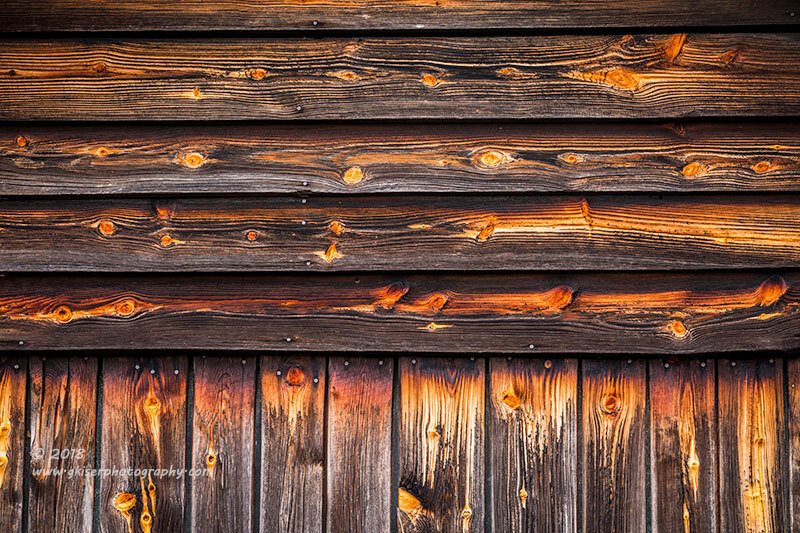 Most of them came from the front of the barn where the wood was the most interesting. I would frame the shots up so that they had the most visual impact, and in some cases I went into full on abstract mode to compose the shot. I made it a point with all of my compositions to find a section that actually said something to me. The interplay of the different elements or textures had to have some sort of meaning to me. One of the things that I really liked to feature was the angles of the wood. 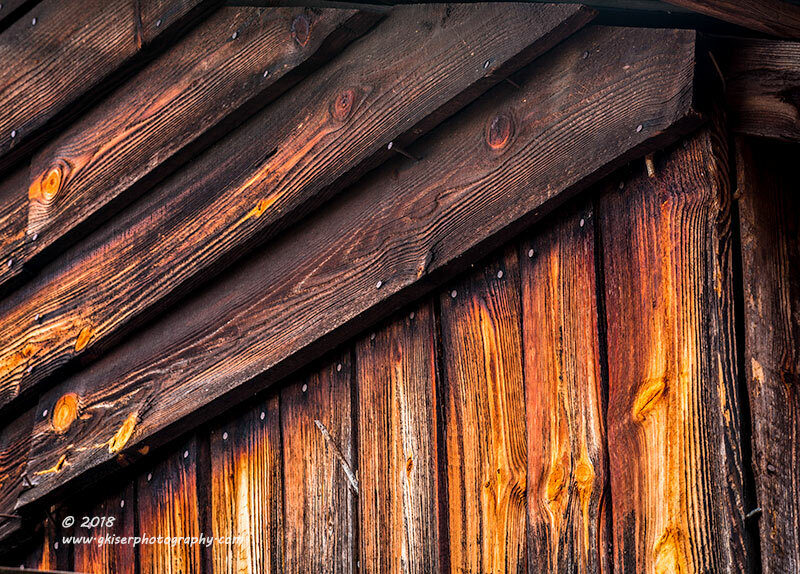 I would capture areas where the wood was placed in different orientations, and in the case of this picture, I shot at an angle to introduce a strong diagonal. Since I was at the corner, I still had the edge of the barn as a visual reference to give the correct perspective. 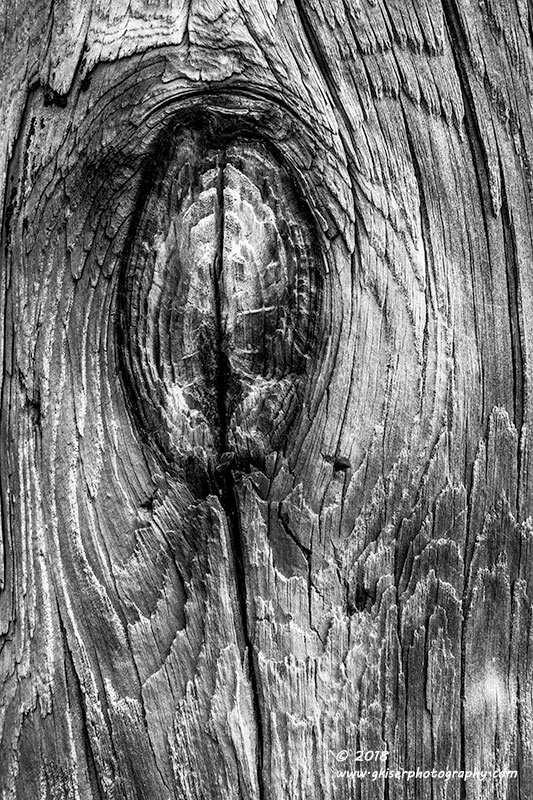 This was a hard image to compose, but I think it is my favorite one from the intimate wood captures. 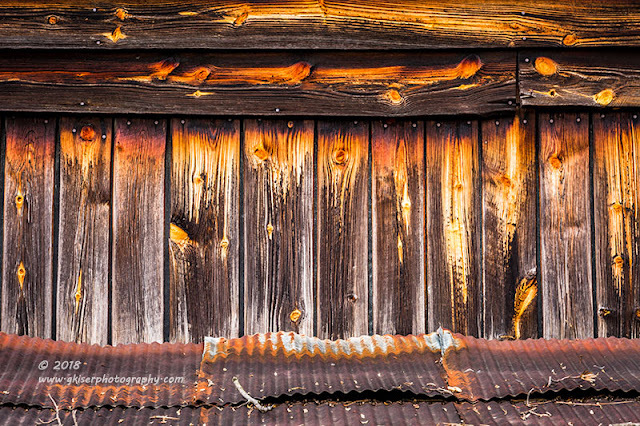 One of the features that I found interesting was on the side of the barn. 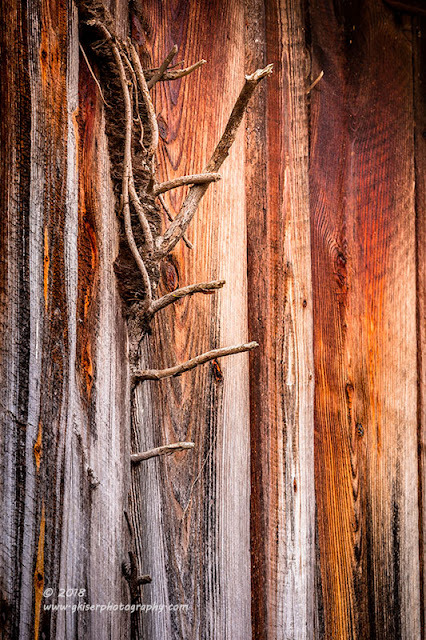 It appeared as though a limb was actually growing out of the siding. I couldn't really explain it, but I found it quite fascinating. I got in close and framed the shot countering the limb with the warm tones to the right. The drab wood below the limb was the perfect highlight to the change in texture of the photograph. This works well as an abstract because the visual clues are so confusing once you start looking into the picture. Had I not explained what I shot, I'm betting you would still be scratching your head. I have to admit, I had a lot of fun picking elements to photograph within the "big picture." Textures are just so much fun to photograph. Speaking of which, the upright supports under the awning at the front of the barn had some really neat features to isolate. Since they are natural wood, both supports had a number of knotholes in them. This was going to be another chance to shoot some really cool textures, and since there wasn't much difference in colors, I was going to shoot them as monochrome images. In an ironic twist of fate, these afterthoughts of a composition turned out to be some of my favorites of the day. 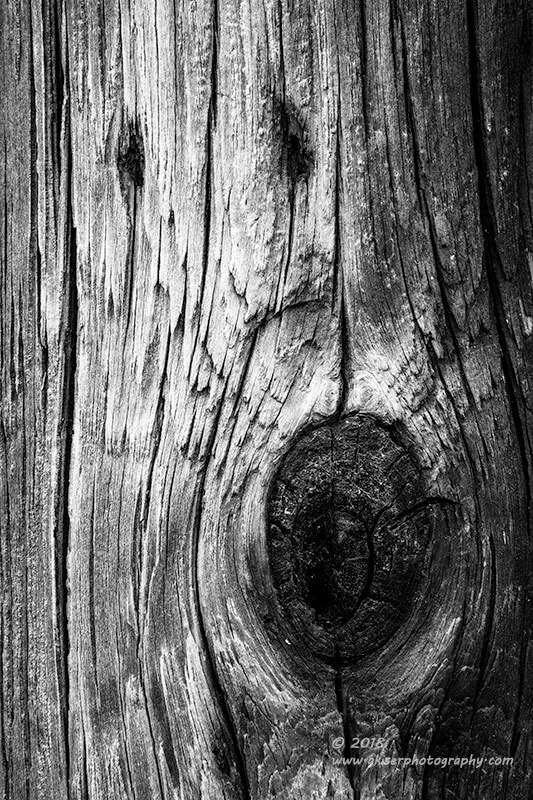 The black and white really made the images pop, and showcased the wonderful textures of the wood. The knots were perfect visual anchors which also caused the lines in the wood to curve around them. The way the lighting was creating shade was another big plus to these images. There was just so much going for them photographically. When I got done with my knotholes, I packed the camera up with a total of 93 frames shot. Without having much clear direction for the day, I was totally thrilled with the outcome. By the time I had gone through the images and culled out the less than acceptable images, I had 17 images from the day. That makes this one of my more successful treks in a while. The amazing part is that the images were from only three different locations. Sticking around to work a scene really pays off in the long run. Now my biggest problem....I've got to figure out how to fit some of these in the gallery rooms here. Not a bad problem to have, but I'm going to have to make some hard cuts I think. A little movie I found about the hotel which was built in the 30's.